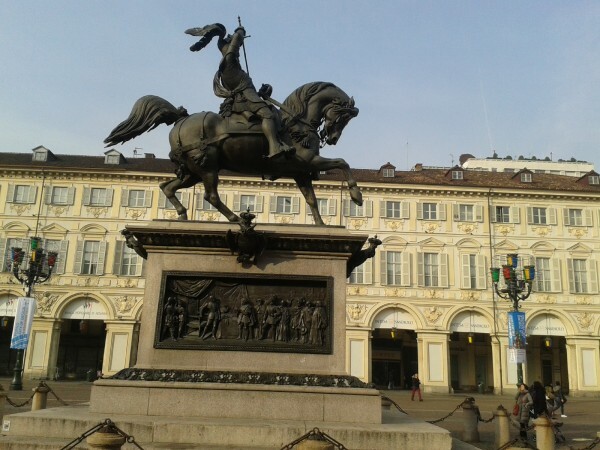 Turin with its art, history, nature, sport and tradition has an exceptional appeal. 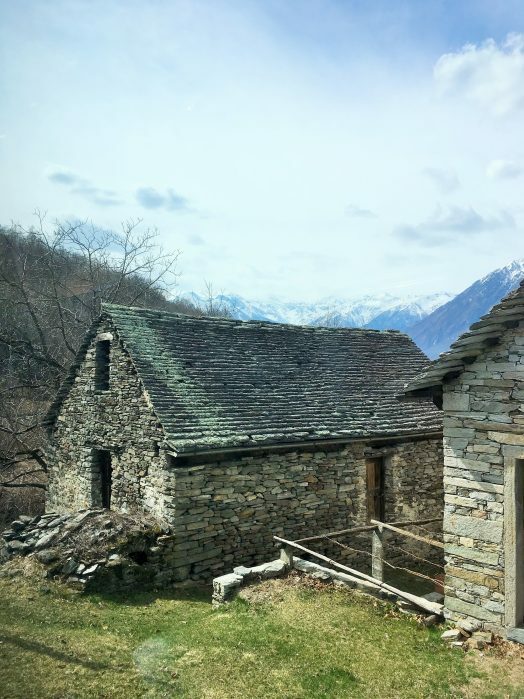 In the province there are endless discoveries to be made, from learning about Italy’s first capital to the Alps of the Olympics and from the hills of Canavese to the summits of Gran Paradiso. 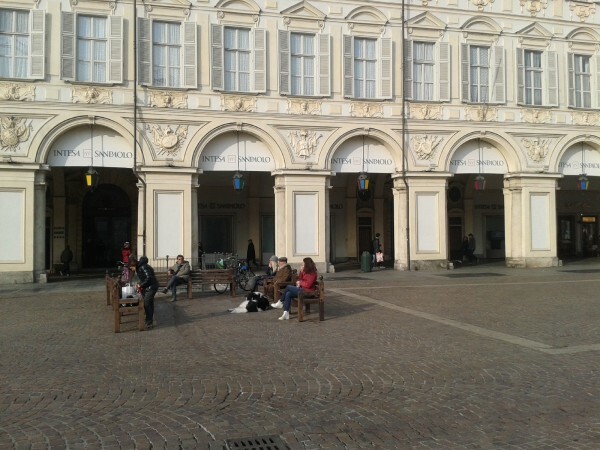 People watching people in the Piazza Castello. 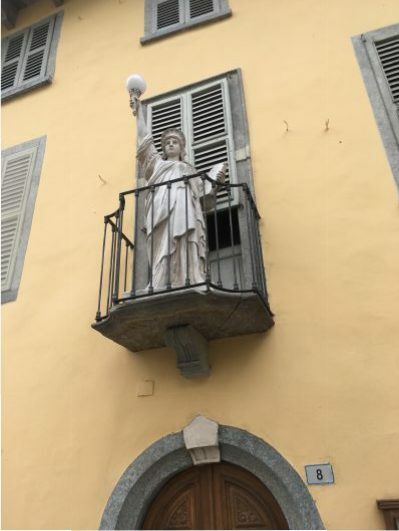 Statues watching people in the Piazza. 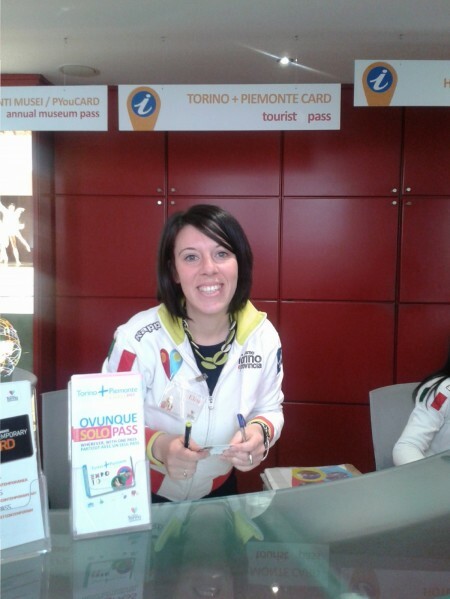 First stop at the Tourism office whereby this lovely lady helped me find the best spots for a quick run around the city in a day. Apparently she’d spent her honeymoon at Kangaroo Island, South Australia – I’ve not been there yet … too busy exploring one of my other favourite countries – Italy! 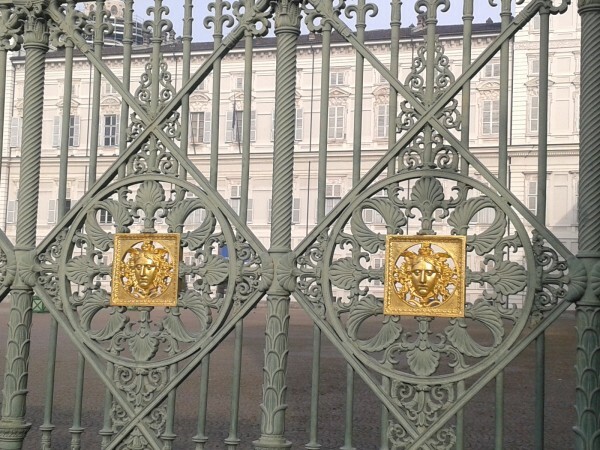 The royal gates of the palace have a golden Medusa symbol embossed on them in order to fend off intruders. 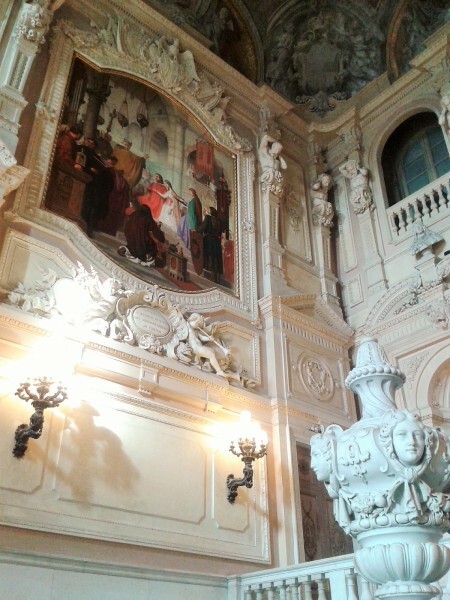 Interior of the Royal Palace which also houses artwork throughout and along the beautiful staircase by Filippo Juvarra. See what happens to metallic monuments etc when they stick their fingers (or toes) out? Beautiful architecture to be admired, just heading off for an espresso. The first machine for making espresso was built and patented in 1884 by Angelo Moriondo of Turin. Thank you Angelo for making one of the best-loved machines the world has ever known. 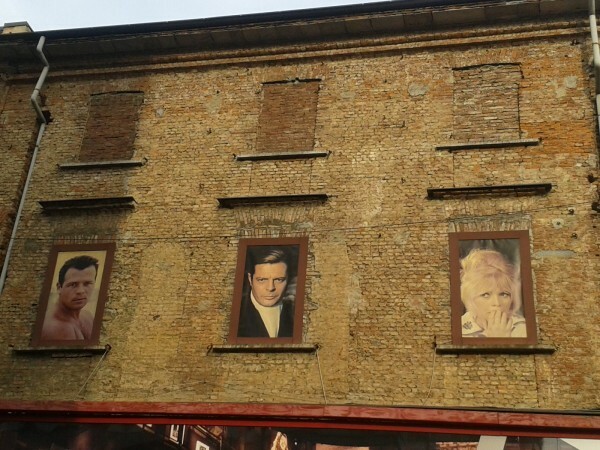 National Museum of Cinema is one of the most important of its kind in the world as the vast collection has many different scientific and educational activities included within. 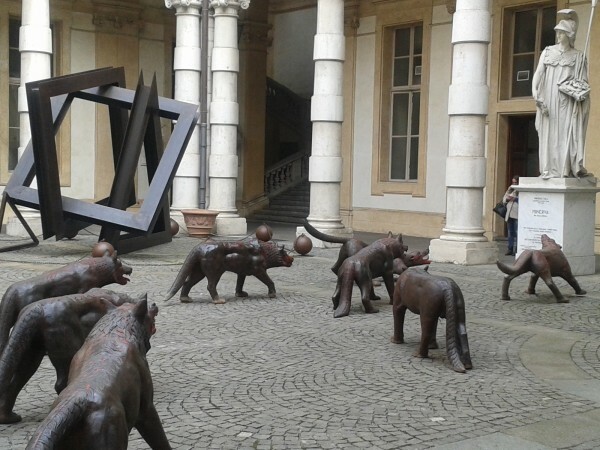 Black Wolves Exhibition – the installation was created for the University of Turin in collaboration with the Italian Institute of Culture in Beijing and the Confucius Institute of Turin. 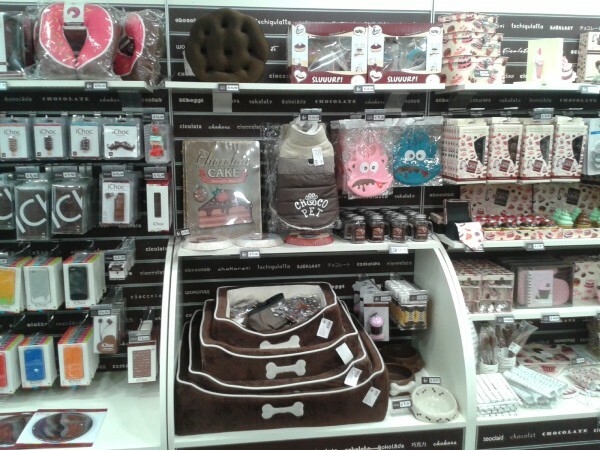 However, only good canines come here and are spoilt for choices. Wolves not allowed. 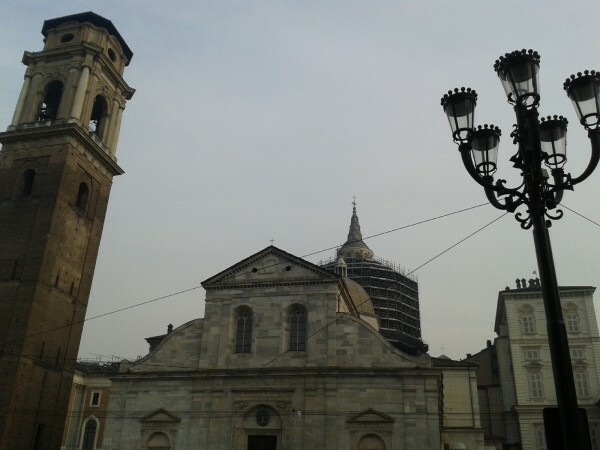 You can see the Cathedral from any direction within the Piazza. 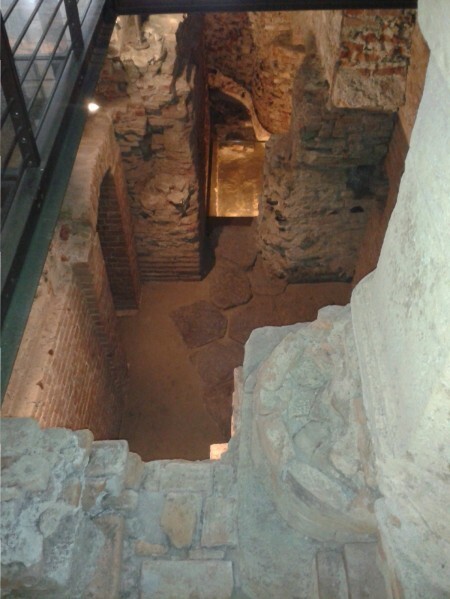 Archaeological dig in the middle of Turin. 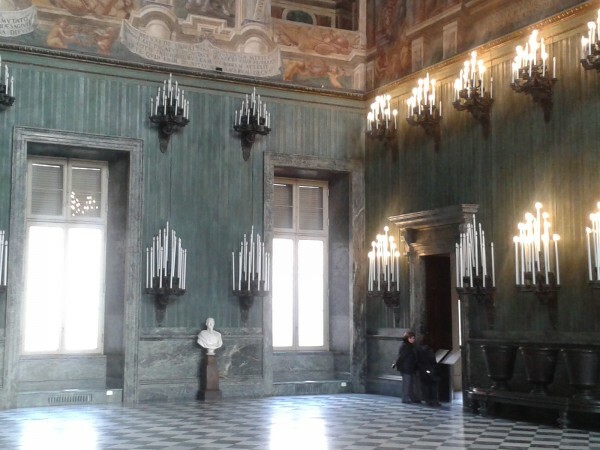 The Palace also includes the Palazzo Chiablese and the Chapel of the Holy Shroud, the latter of which was built to house the famous Shroud of Turin. In 1946, the building became the property of the state and was turned into a museum. 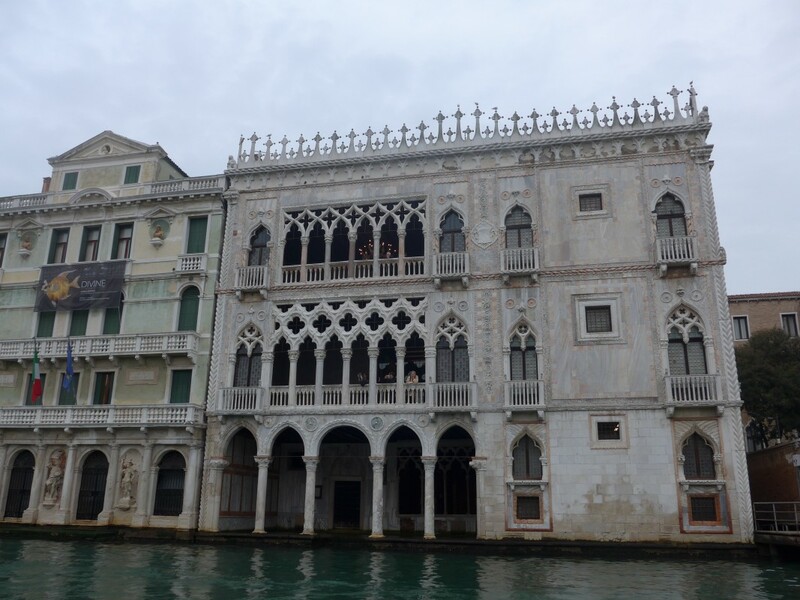 In 1997, it was placed on the UNESCO World Heritage Site list along with 13 other residences of the House of Savoy. 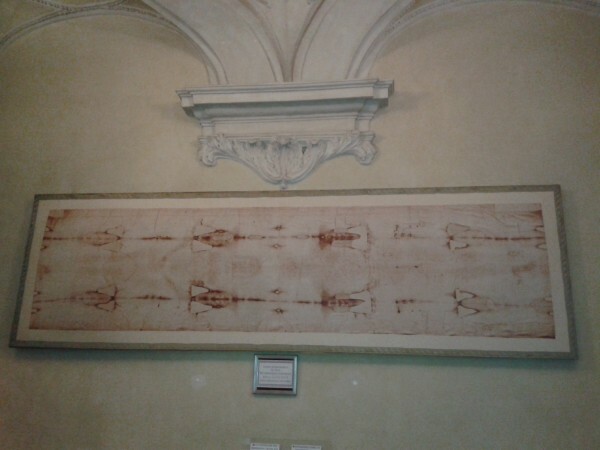 Copy of the The Shroud of Turin or Turin Shroud, a length of linen cloth bearing the image of a man, is believed by some Christians to be the burial shroud of Jesus of Nazareth. 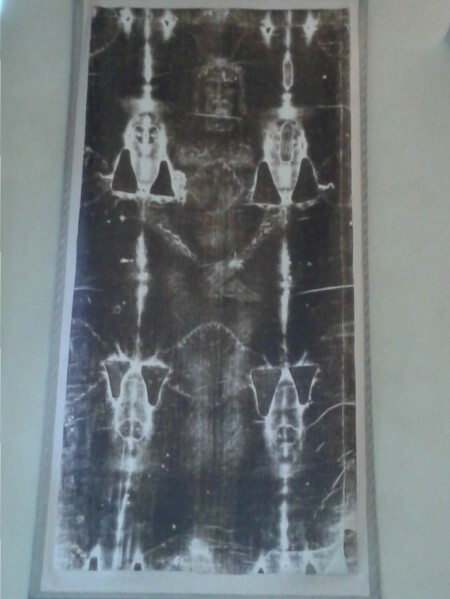 The original Shroud is kept in the royal chapel of the Cathedral of Saint John the Baptist in Turin. 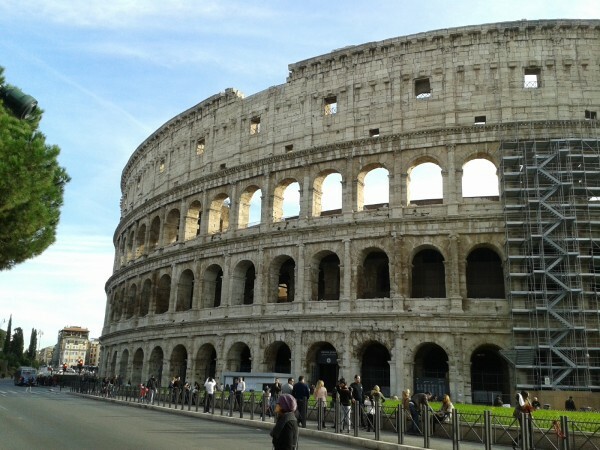 Remember your first trip to Rome? How could you forget falling for one of the most romantic, sophisticated and yet historically significant cities in the world. Here at the Spanish Steps quite some time ago it was just delightful to hang about – considering it was my first European trip. However on this occasion, the area adjacent to the Steps were just being transformed and not yet complete … So I’ll have to show you around some other favourite spots of mine. Running shoes on and about to revisit one of my most-loved cities in Continental Europe. 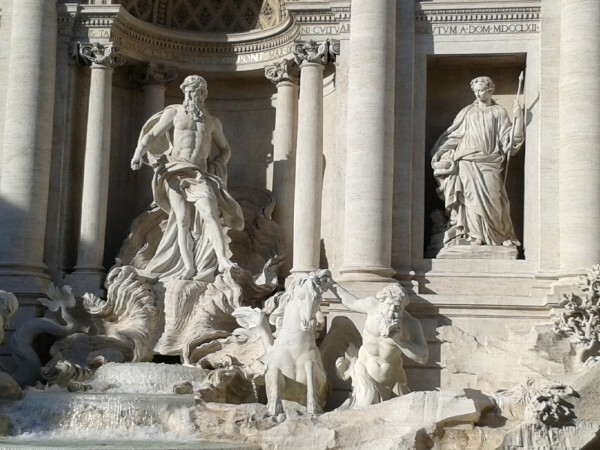 Undoubtedly, one of the big favourites – Trevi Fountain was designed by Italian architect Nicola Salvi and completed by Pietro Bracci. 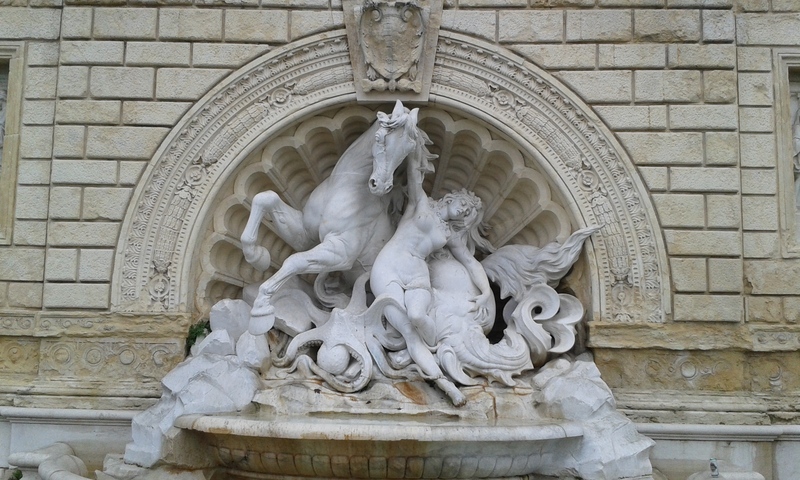 Standing 26.3 metres (86 ft) high and 49.15 metres (161.3 ft) wide, it’s the largest baroque fountain in the city and in fact one of the most famous in the world. 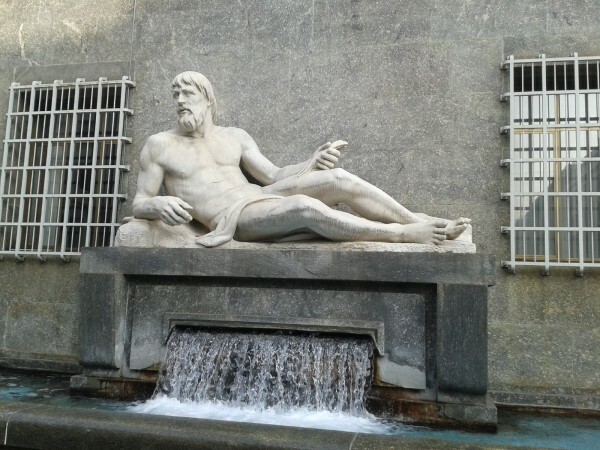 It’s appeared in several notable films, including Federico Fellini’s La Dolce Vita. 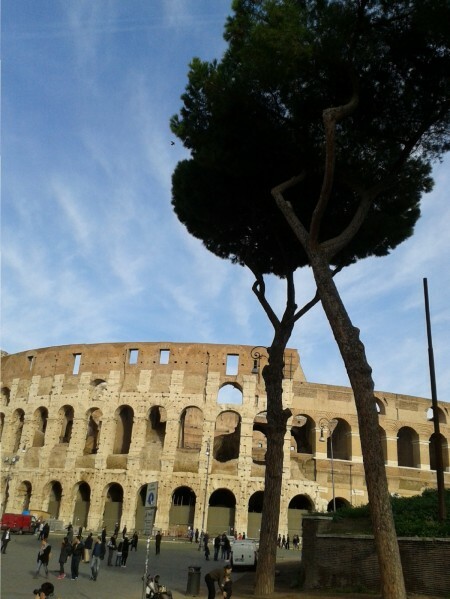 Just situated just east of the Roman Forum, it could hold up to 80,000 spectators in its day and used for gladiatorial contests and public spectacles such as animal hunts, executions, re-enactments of famous battles and dramas based on classical mythology. 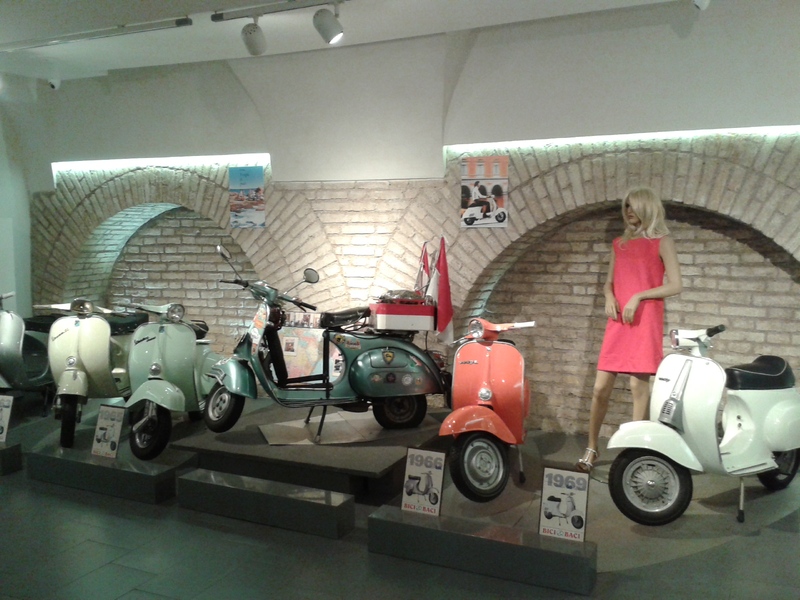 Not too far away is the Vespa Museum – Free Entry! Worthy of a visit. 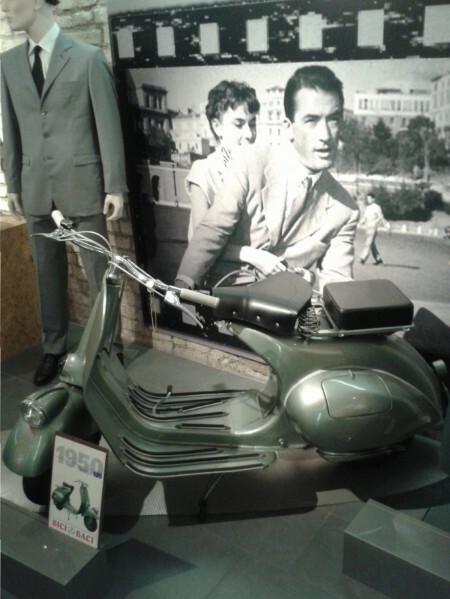 And you have the chance to view Audrey Hepburn and Gregory Peck on their Vespa from the movie Roman Holiday. 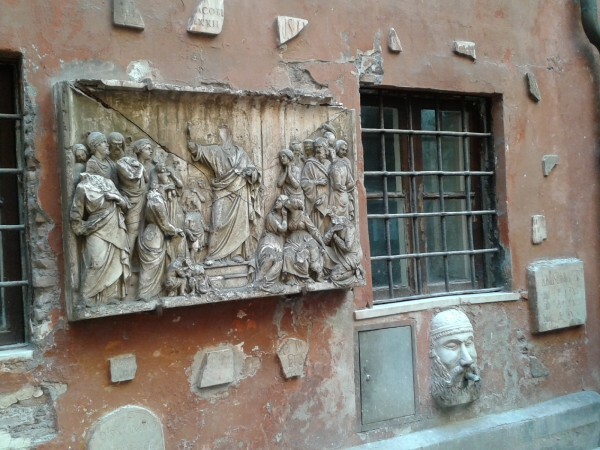 The Mouth of Truth can be located at the church known as Santa Maria in Cosmedin. 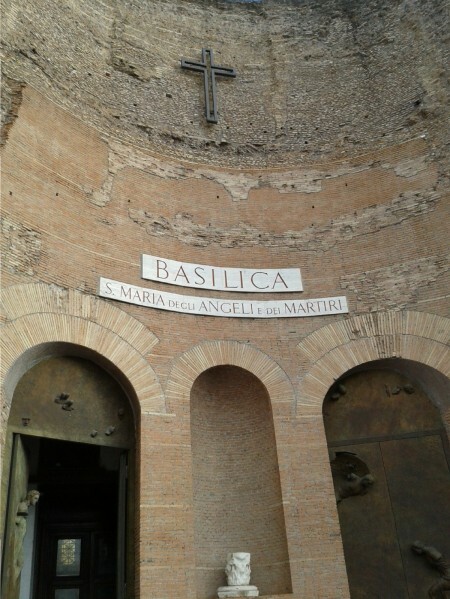 The Basilica of St. Mary of the Angels and the Martyrs, Michelangelo achieved an unexampled sequence of shaped architectural spaces with few precedents or followers. 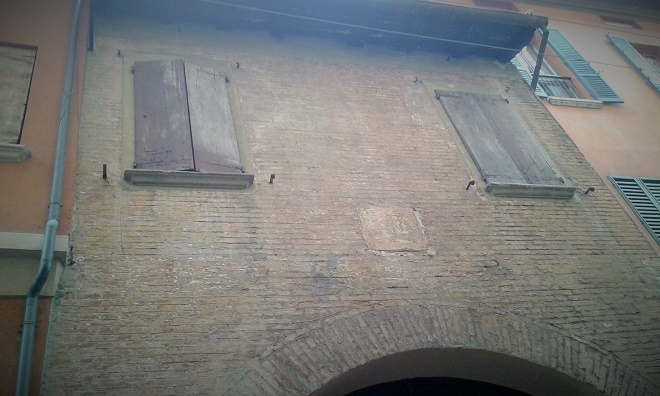 There is no true façade – the simple entrance is set within one of the coved apses of a main space of the thermae. 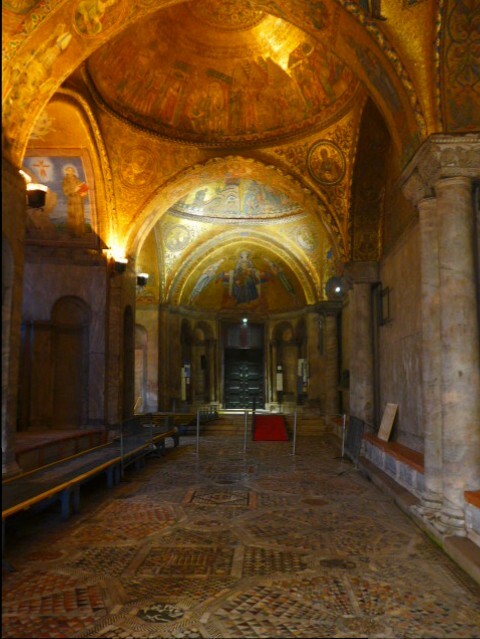 Additionally, this Basilica is used for many ceremonies including the funeral of soldiers killed abroad. 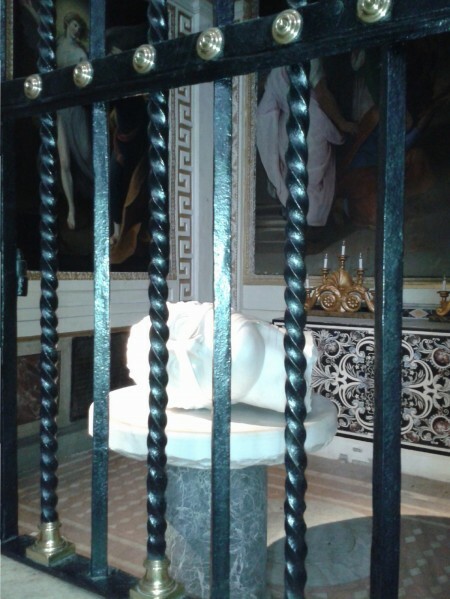 Dedicated to the Christian martyrs – both known and unknown. The Tomb of the Unknown Soldier. 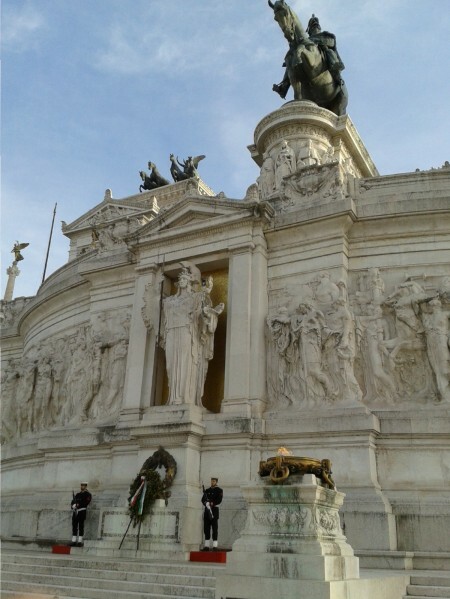 The National Monument of Victor Emmanuel II (Monumento Nazionale a Vittorio Emanuele II) is a remarkably large building made of white marble. 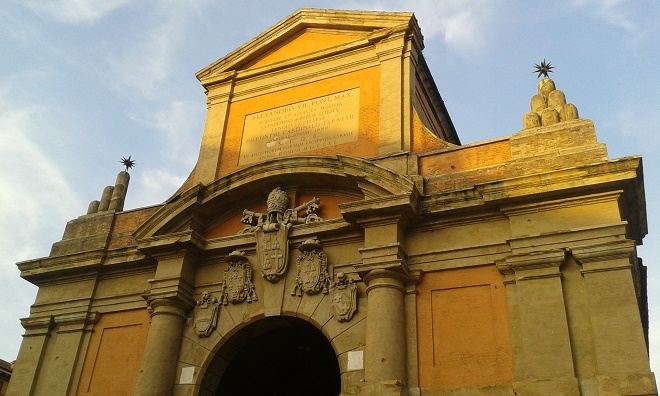 Although not having towers in its general design, the medieval structure still attracts attention from almost all parts of Rome because its colour stands out in an array of other earth-coloured buildings. 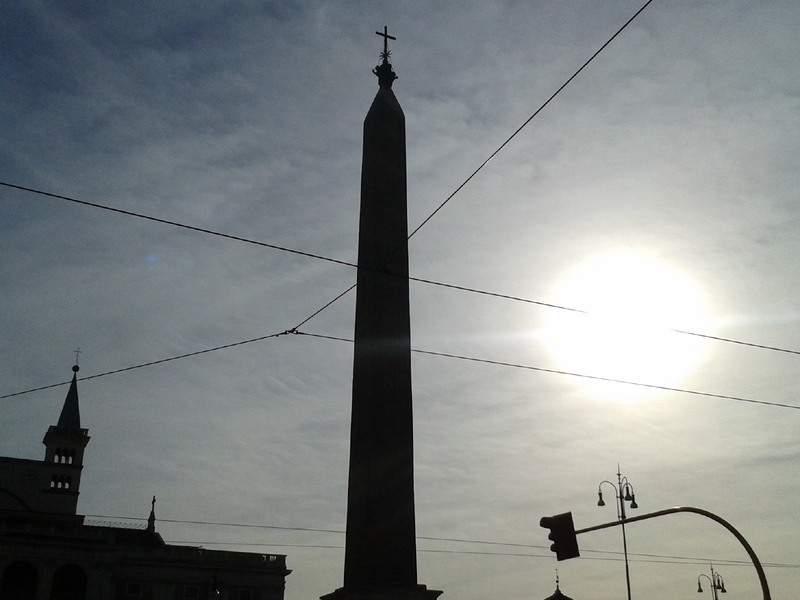 It is situated between the Capitoline Hill and Piazza Venezia and features some statues, columns and grand stairways. 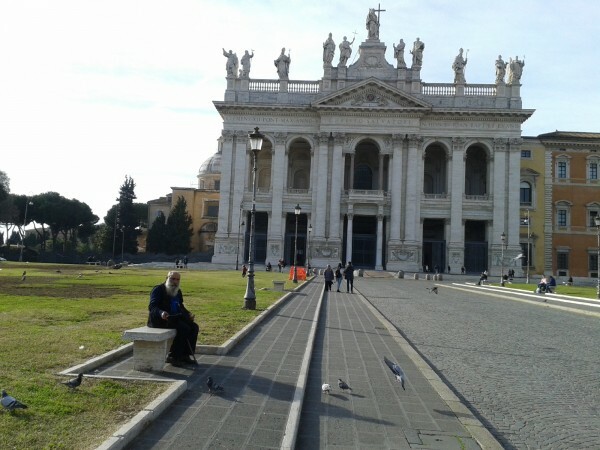 Basilica of St John Lateran (San Giovanni in Laterano), the present structure of the Basilica resembles the St Peter’s Basilica and the ancient church was residence of the popes until the coming back from the exile in Avignone (1377), when it was moved to the Vatican. 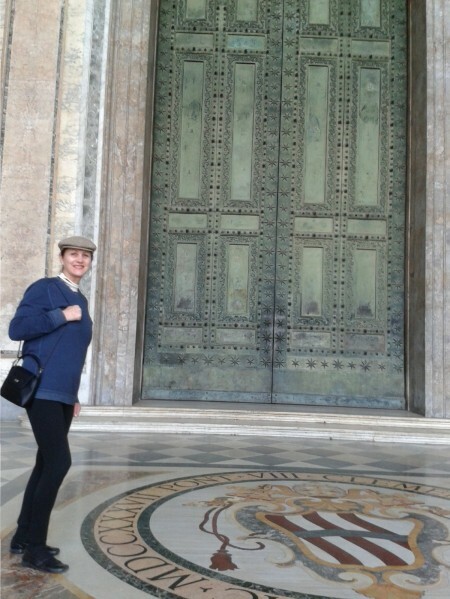 The central bronze doors are Roman originals from the Curia (Senate House) in the Imperial Forum. It’s for real. 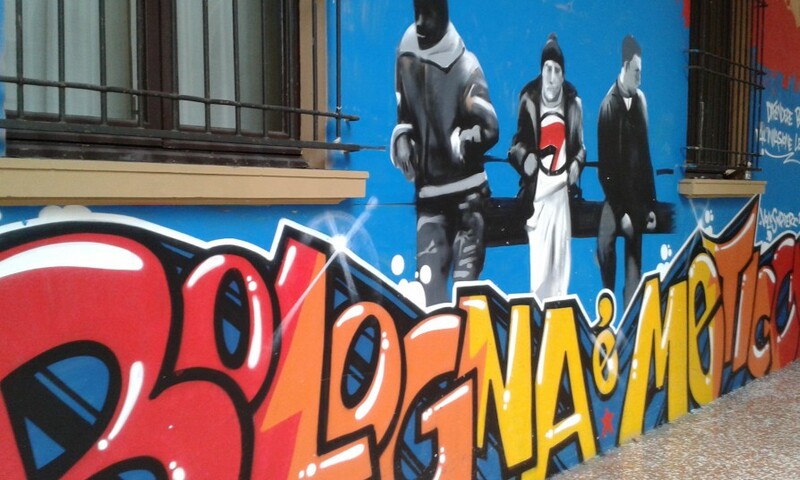 And not being used to seeing historical artefacts on display whilst walking around the streets, I’m thinking it’s not at all like my usual neighbourhood’s street art at home … Pleasantly surprised of course. 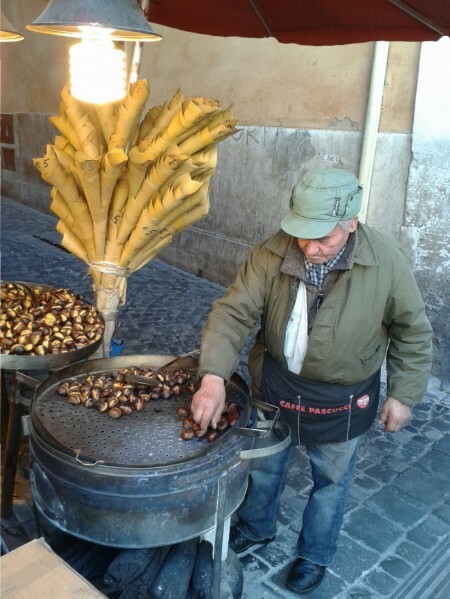 Time for a snack, hot-roasted chestnuts this time. 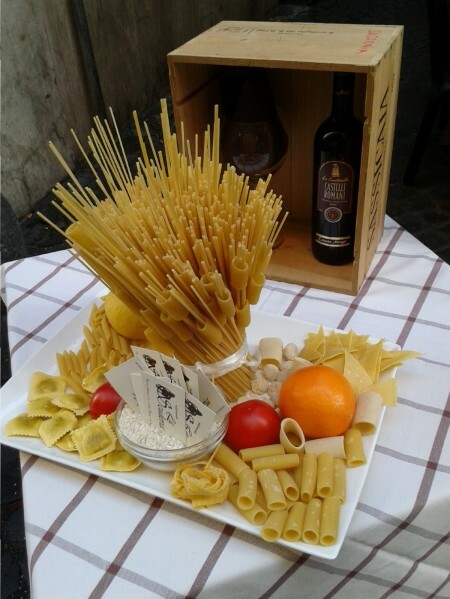 Followed by a proper Italian lunch of pasta, I just have to choose my sauce. 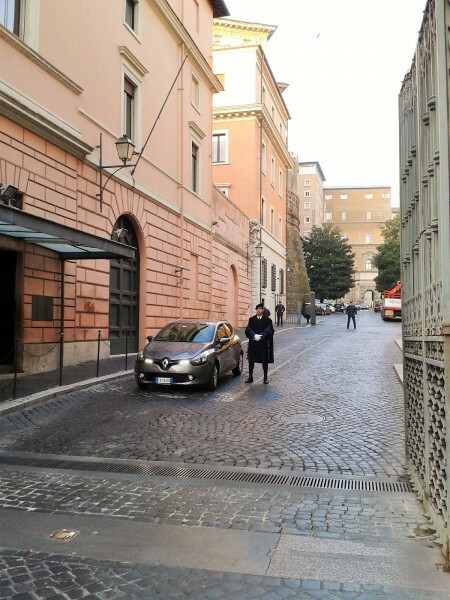 Not forgetting to call into the entrance of the Vatican City to check there’s still a ticket available for the Papal Audience which is held on a Wednesday morning in front of the Basilica. 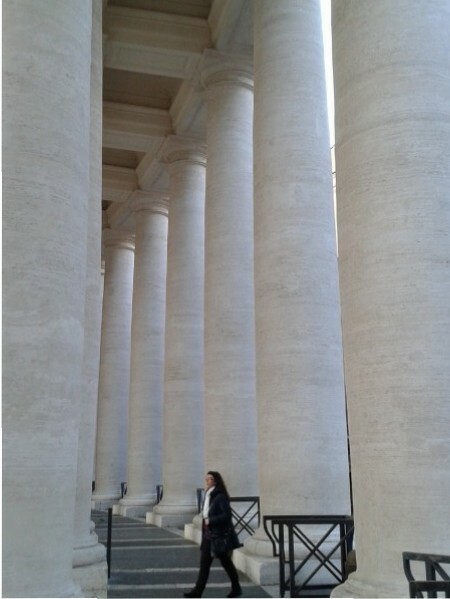 If you need less than 10 tickets you can normally pick them up without a reservation from the Swiss Guards at the “Bronze Doors” located just after security at St Peter’s Basilica. 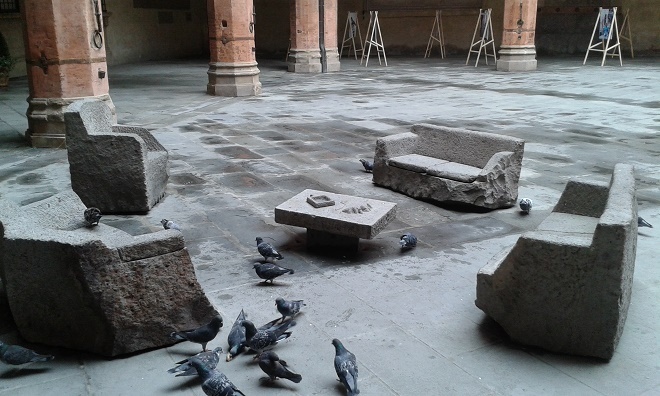 Just checking the seating arrangements this time around as it’s been busy in the past, especially when it used to be inside the Basilica. 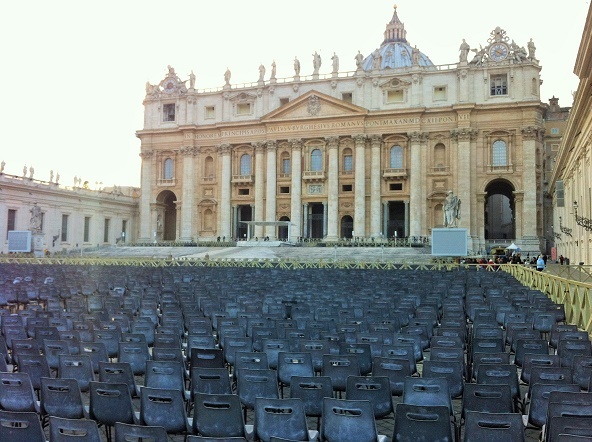 I just happened to be lucky enough on my first visit to be in the front rows with Pope John Paul II officiating. At the end of the day it’s time to go home and rest up. 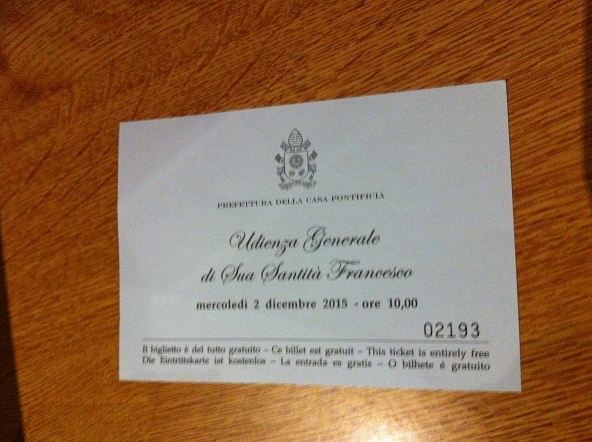 I’ve decided to stay an extra couple of nights now I’ve my ticket to the see the Papal Mass for the People. Happy to have my ticket on show and looking forward to attending once again. 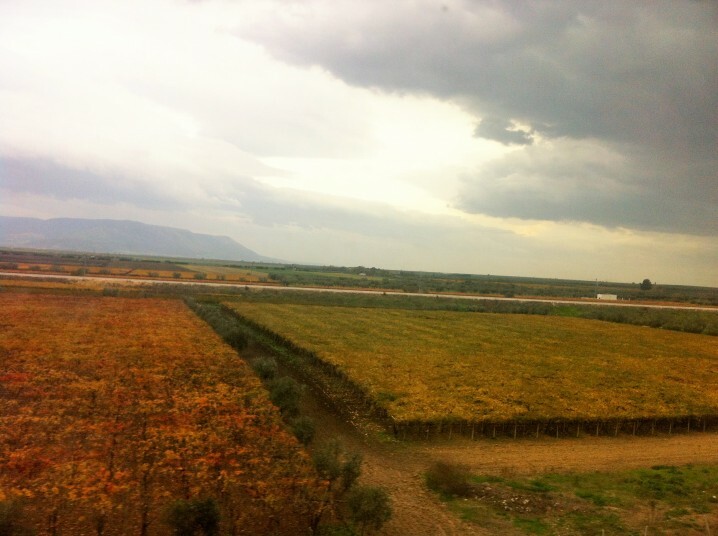 My Story … Naples to Sicily, Italy. 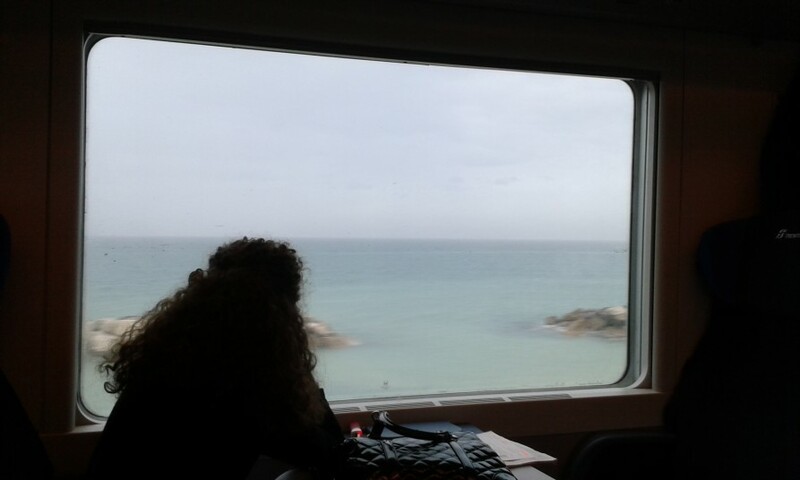 Unfortunately, there wasn’t a lot to report from Bari to Naples by train as the weather was inclement with very little photo opportunities and the outlook diminished somewhat. 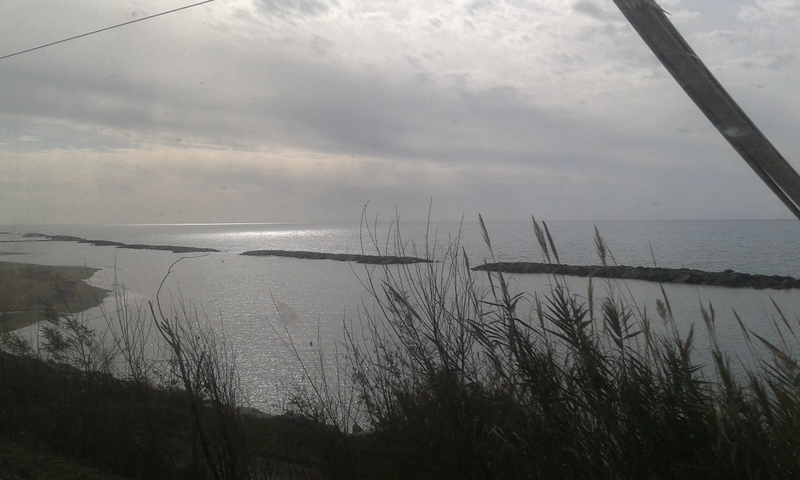 I know I could’ve flown to Sicily, but for me it’s about seeing the lay of the land and enjoying the rocking, rolling sojourn of a rail escapade. 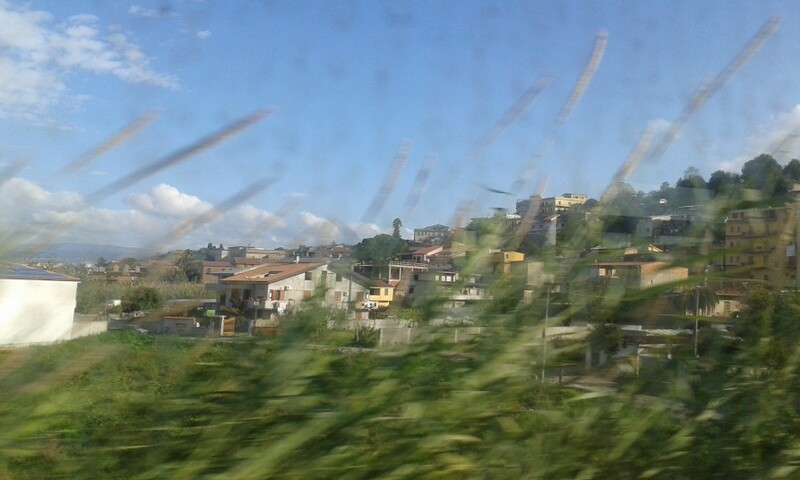 However, this next post I’d penned mostly as a recount of my train journey last year from Naples onto Sicily. For those who know me well, you will again read excepts from the Facebook Page ‘You Know You’re from Cowra When…’ And, because Cowra was where my parents as ‘Displaced Persons’ had settled after arriving in Australia, I felt it was fitting to write about some of those insights. Firstly, they were at the Bonegilla Camp (like many others), and they too had left war-ravaged Europe and mine embarked on their new life from the seaport of Napoli and the records show the Ship Nelly had arrived late November, 1949 into the Port of Melbourne, Victoria Australia. 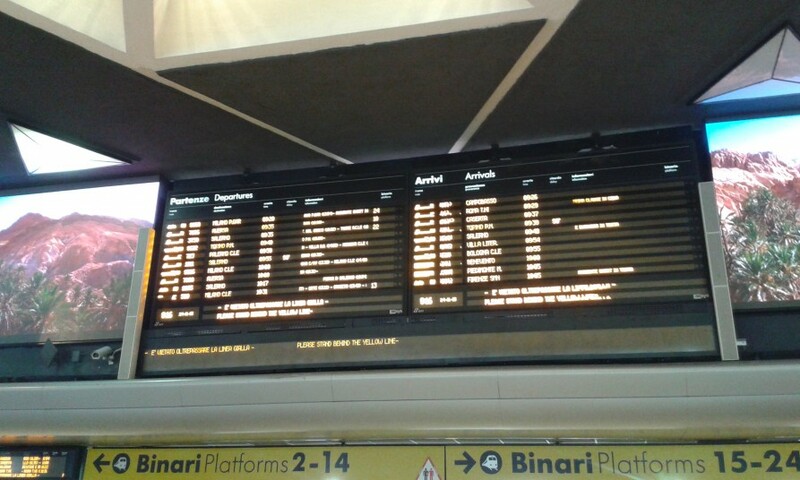 Whilst I was standing here at Napoli Termini looking at the schedules, I’m pondering what life may have been like as post war-torn Europe tried to repatriate its peoples – most of whom would never return to their origin after leaving its shores hoping for a better life, leaving their families behind and facing an uncertain future. Königsberg (until 1946 officially: Königsberg in Preußen) Now Russia’s Kaliningrad it was the first opportunity we had access as part of a tour. Photo taken in 1997, and on this visit with my cousin Beine and Uncle Reinhard, we found the family farm of which the nearby township no longer exists of its old name – just like many other European places. Additionally, many country’s borders had changed after the war and of course, the division of Germany being the most evident. This is my story, partly of my family’s early life in Australia, perhaps I’ll write more about it at a later stage … These are the excepts from my journey in November, 2015 of my thoughts and maybe one answer to Jean’s post. See below. “On Facebook I’d read with interest Jean Eade’s post of ‘Town Revival’ with Cowra having been given as an example to the dwindling numbers of country towns. What they seemed to have forgotten is the post-WWII immigration of the 1950s onwards – when towns such as Cowra swelled due to the then current Government’s slogan of ‘Populate or Perish’. There was an influx of new migrants who helped form the backbone and soul of this community’s psyche. In terms of multiculturalism, I believe Cowra was somewhat ahead of its time, considering the diversity, skills and cuisine offered to a small rural epicentre; of which they had to call their new homeland – for better or for worse. 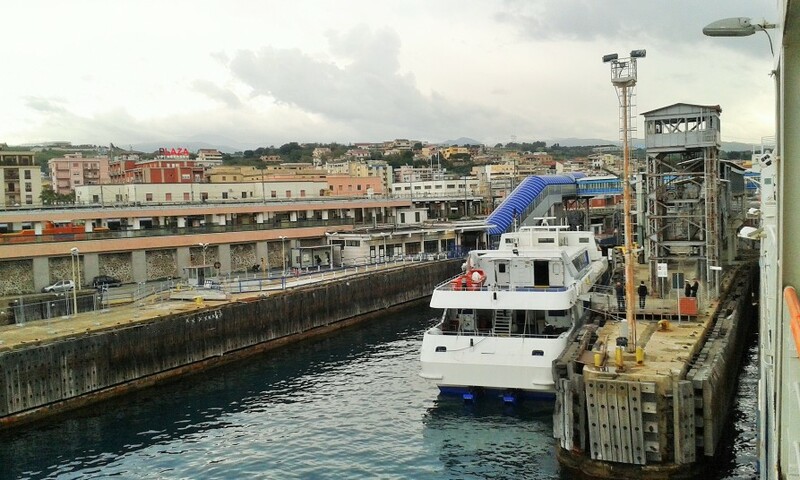 After I boarded the train in Napoli (Naples, Italy) heading onto Sicily with a nine-hour trip ahead of me, it brought back a few memories of what it was like growing up with European parents who’d left their very own world from this Italian port. 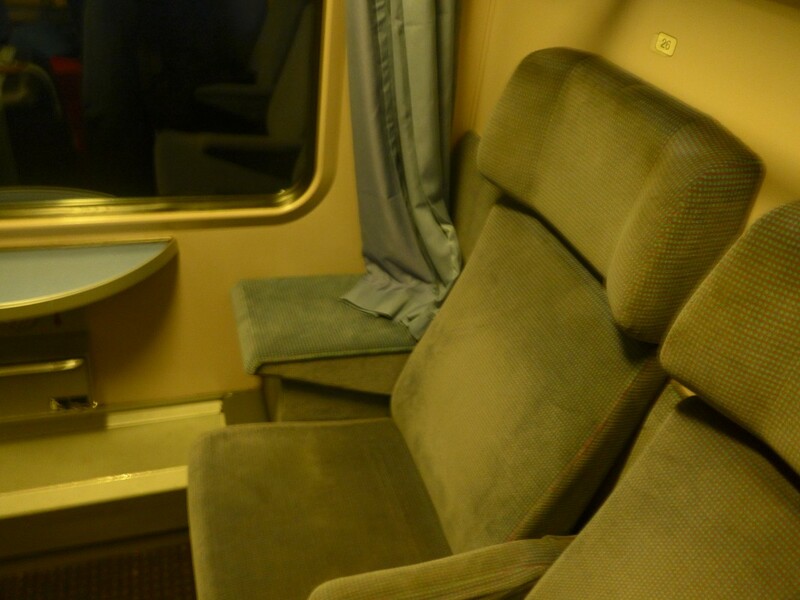 On this sector of my trip, I was holding a Prima Class ticket and I knew that the train would eventually divide at some point, I’d then have to move to another carriage to ensure I ended up in the right destination. 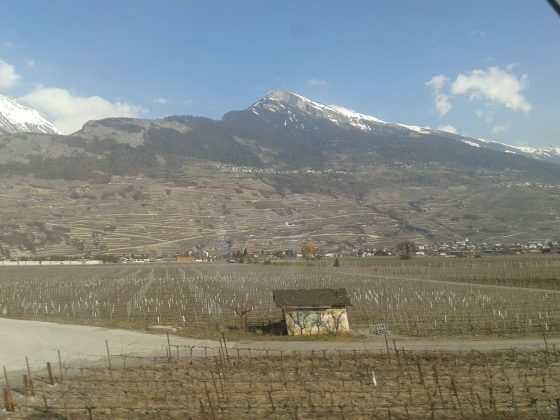 Once the conductor came along, he tried to explain reluctantly, but as luck would have it, I was seated next to an Italian Professor who spoke ‘good’ English and informed me when I needed to shift myself to another carriage. Afterwards, we chatted and the Professor asked me, how many days would it take to sail by ship to Australia? Clearly he could see I couldn’t answer immediately as I had reflected when Mum talked about the journey from Napoli, Italy to Australia; going back then through the Suez Canal when it was still opened and then onto Melbourne, Australia. Even as of today, I don’t believe there are any passenger ships which solely cruise direct from Europe to Australia. Maybe he had me bemused – because I was awokened to the fact this was exactly what my parents and two older brothers did in the latter part of 1949; one of which who had to be ‘fattened up’ due to having rickets before being permitted the stamp of approval to travel. 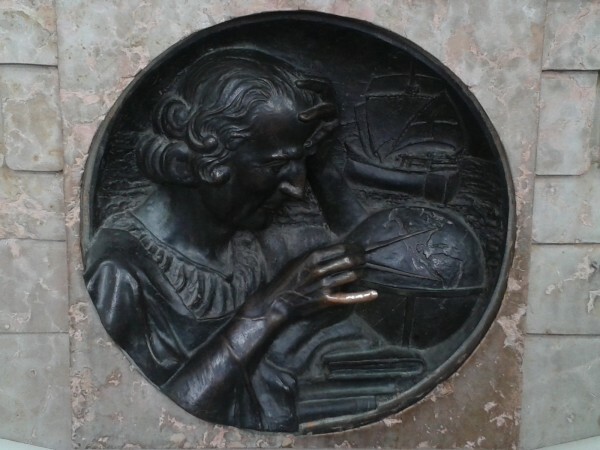 They embarked on a voyage to the southern hemisphere which was as foreign to them, as were they to Australians. 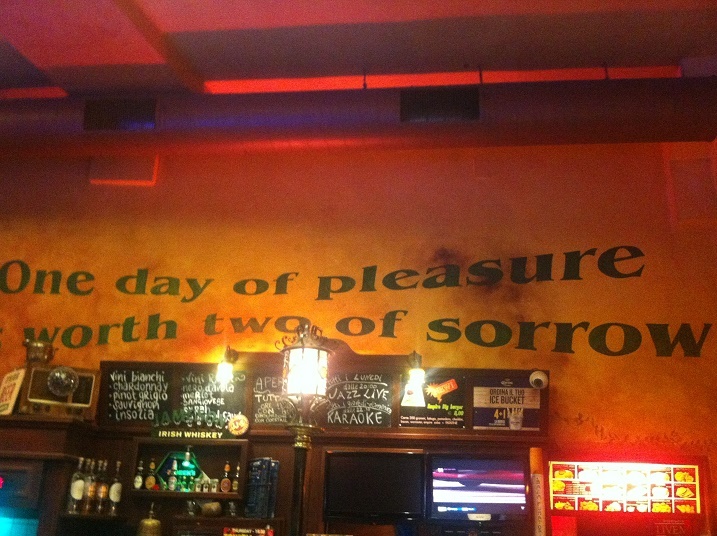 And, not just by language or borders, but a whole new ‘she be right mate’ way of life. The question of being asked how many days sailing, can only be described in my mind as, what would’ve it been like if sailing to Australia on a luxury cruise liner as opposed to a ship load of immigrants? They were about to become New Australians (as the Government then coined their status), trying to embrace their new ‘one-door opening and another closing’ ideology – not necessarily having a marvellous time for the duration of the voyage. Anyway, I have given this some consideration over the years and I believe Cowra was in fact ahead of its time in regards to multiculturalism and acceptance. 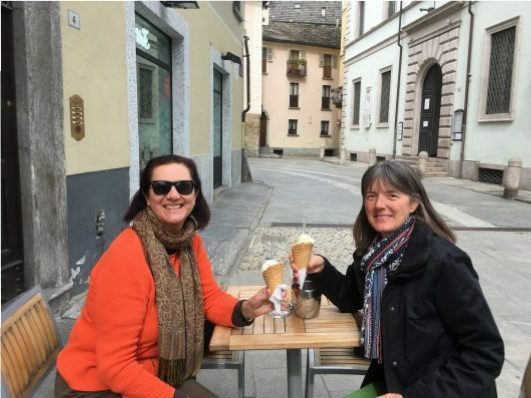 I feel, many of the nationalities bestowed upon Cowra made it one of the most diverse small European communities in Australia without maybe realising it at the time. Move aside Melbourne … We already knew what it took – with a population which was miniscule by comparison to this cosmopolitan city, we were entwined with a varied assortment of nationalities and a kindred neighbourhood-like spirit. Everyone seemed to ‘get on’ with life and held similar Christian values and judgements. 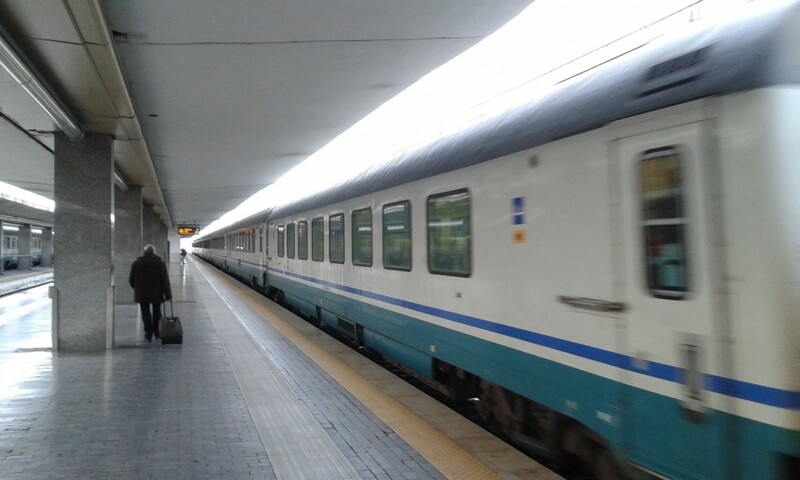 Our train was then prepared to be loaded onto the ferry for transportation for the 20-30 minute crossing from San Giovanni, which incidentally was a truly thought-provoking encounter. What if this was me sailing into unknown territory as a migrant? I don’t know the language for starters or customs, nor what lay ahead in terms of a home to live? How would I have been in a totally different environment trying to fit in if it had been me heading to say, this new land? Luckily I’m on holiday and just blogging along as I go. Coleone family and mafia were still being spoken about by my new companion. My guardian, if I can call him that, looked out for me throughout the remaining five-hour journey to Palermo, even though I understood he was alighting at Terminal 1 before me, his instructions were clear. 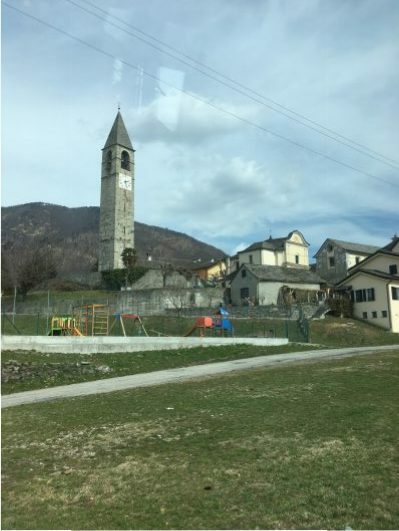 However, once we arrived at San Giovanni, the train did indeed divide and importantly we were in our correct places at the time. He pulled out of his pocket a three-pronged key meant for carriages on different train services – not just in Europe (not unlike a wheel brace to look at) and he offered to lock my carriage door like his. I thought perhaps he was a retired train conductor with his precious spanner which would make us a little safer in a world full of materialistic people? Sometimes, you just think to yourself, maybe you’re in the lap of the Gods and you need to just trust in what’s before you. 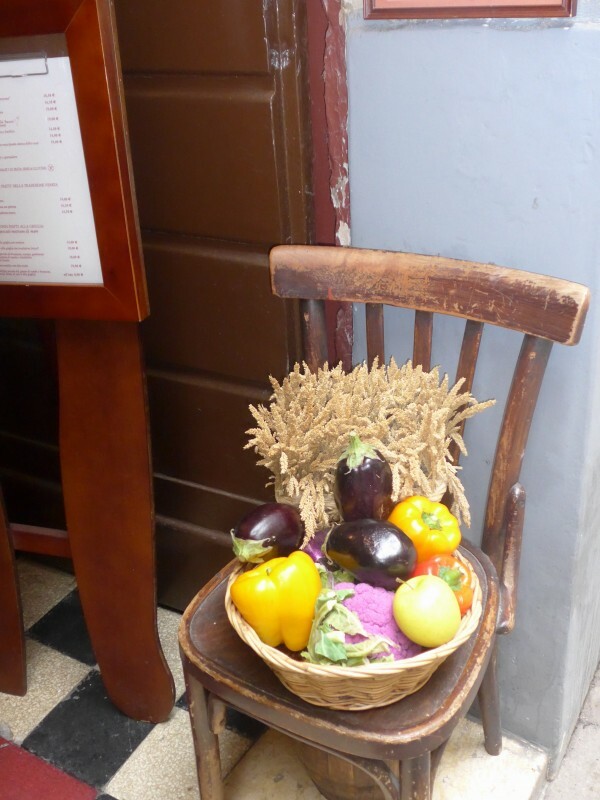 All what was in my suitcase – was it really all that important? Not at all. As long as I had my documents and something warm to wear, that’s all that really matters. 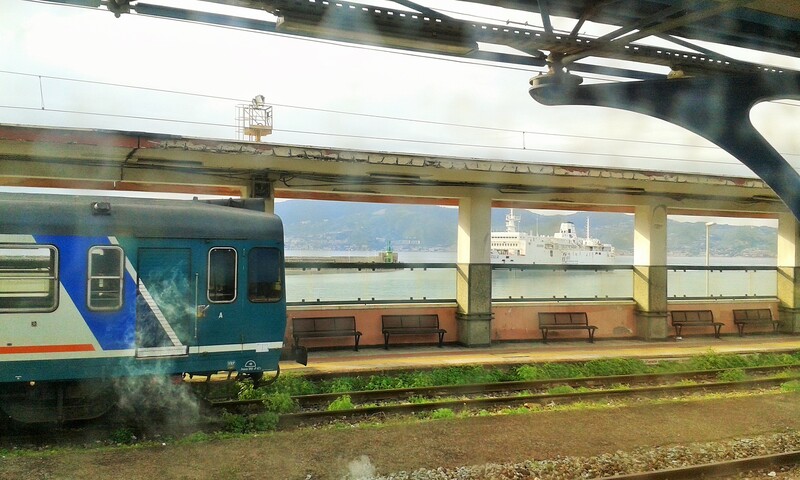 He and I meandered up to the top deck of the ferry after leaving the train’s compartment and then watched San Giovanni slowly disappear from our view. 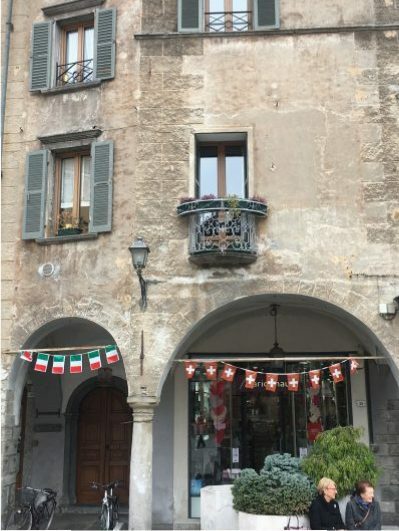 Certainly not something I’ve experienced before, but this elder had witnessed it many times and you could tell he was excited about going home to his family and something I admire greatly about the Italians – their sense of home and family. 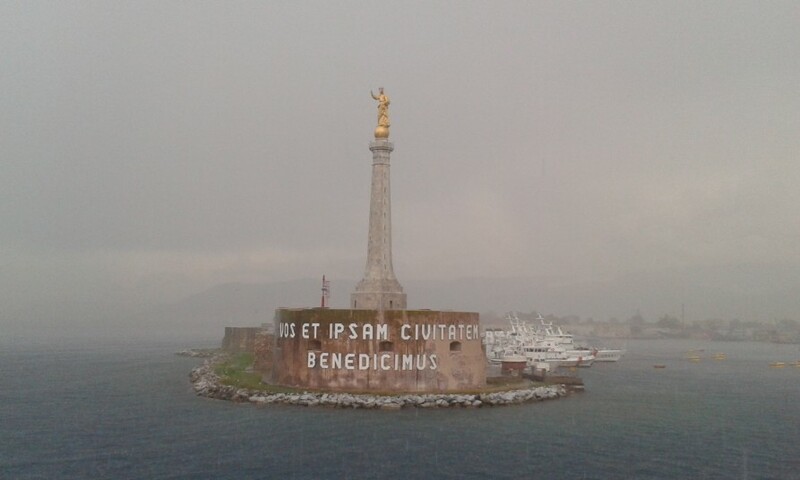 It pelted down with hail as we glided past the seven metre-tall golden Madonna guarding the entrance of the port in all her glory looking out across the Strait of Messina. 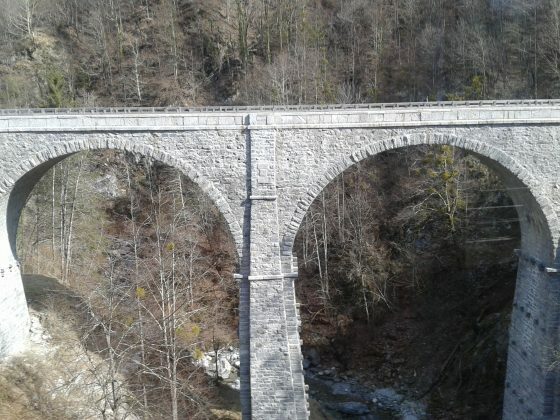 Once on land again at Messina and the train offloaded onto the tracks, it was again divided and separated with the rear-end carriages departing for Syracuse and the remainder of us continuing north to Palermo hugging the coastline. 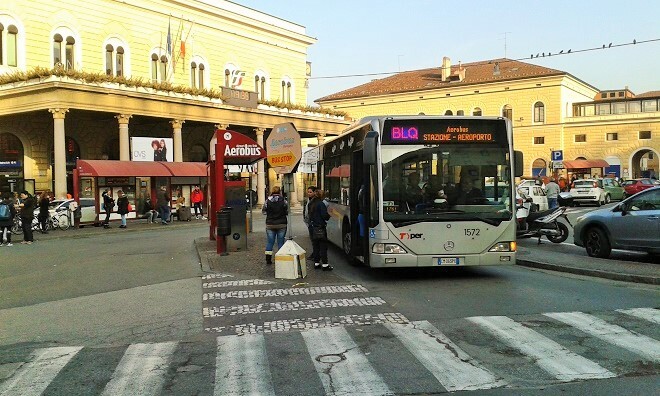 Heading into Bologna city from the airport, you’ll witness some of the best rural properties whereby the grapes and crops give Italy and the world its favourite wines, vinegars, pastas and the most wonderful culinary dishes you could wish for. 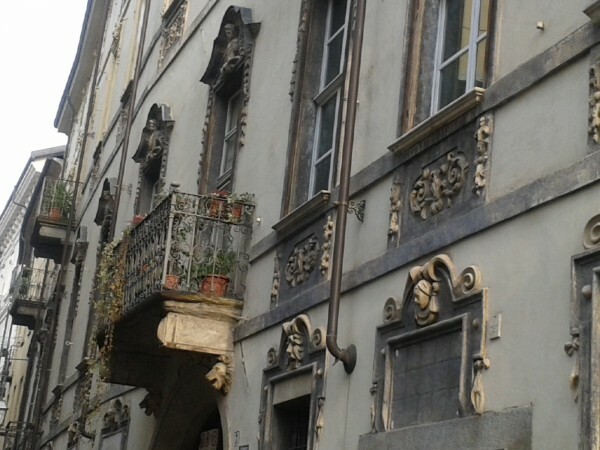 Many years ago, whilst backpacking in Florence I realised there was a need to shift off the usual tourist trail. However a quick look at a map and there was Bologna? 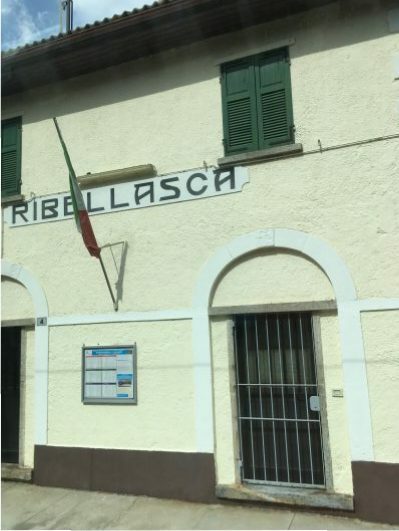 Not only did the name intrigue me, but it’s where Artusi recorded and subsequently published his recipe for Maccheroni alla bolognese, better known to us Aussies as Spag Bol (Spaghetti Bolognaise) and one of my all-time favourites. 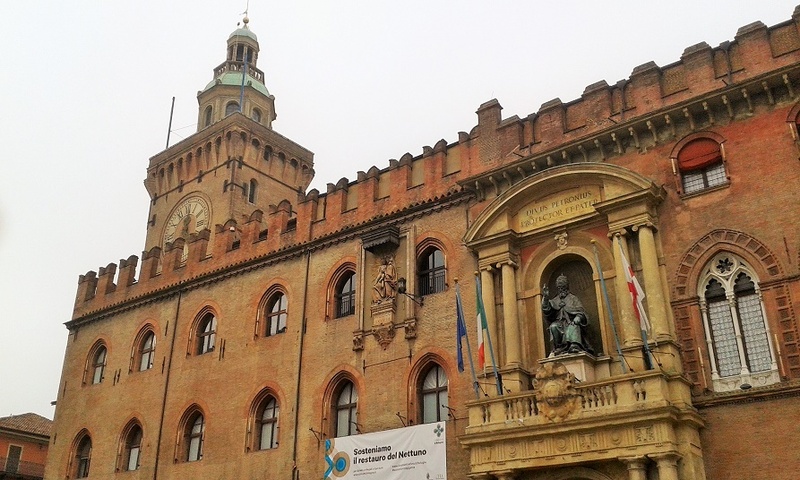 Bologna is so close to Florence, it’s a really easy day trip by rail, however one day is not enough, hence the reason for a return to explore it a little further – even after all this time. The airport is named after native Guglielmo Marconi, an Italian electrical engineer and Nobel laureate who began to develop the system of wireless telegraphy which then spread throughout the world. 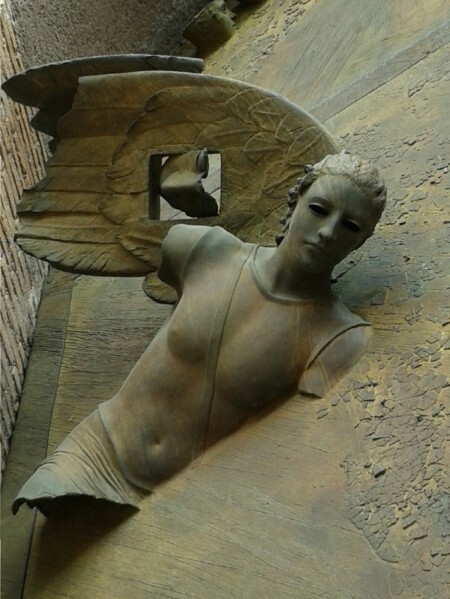 His Villa Griffone is a National Monument and is located in Pontecchio Marconi, about 15 km from Bologna. The garden and the rooms of the villa are home to the Marconi Museum which is dedicated to the origins and development of radio communications. And not surprisingly, there’s amass of liberal students who reside here and call it home as it’s considered the world’s oldest University and believed to date back to 1088. 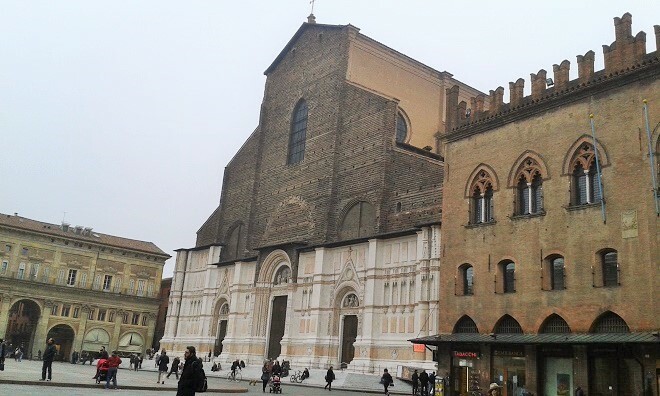 Named in honour of Bologna patron saint Petronio – 8th bishop of the city from 431 to 450, the Basilica is the most imposing and has certainly stood the test of time for all to see and enjoy its might and power. 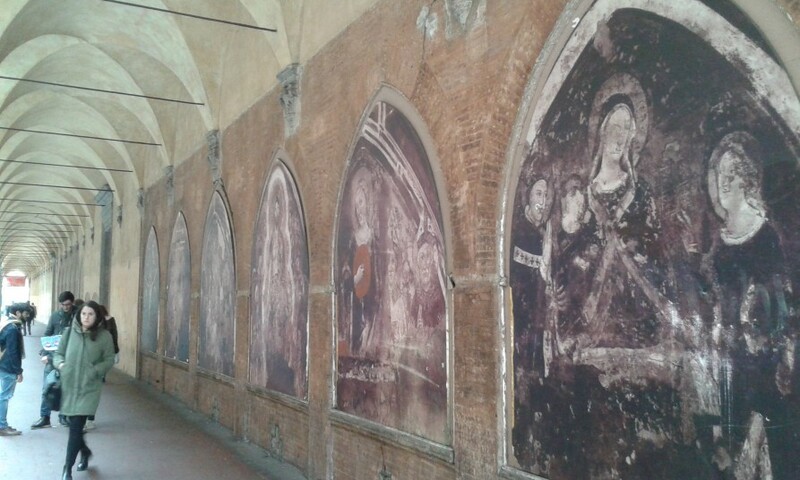 Madonna frescos can be seen just walking along the colonnades. 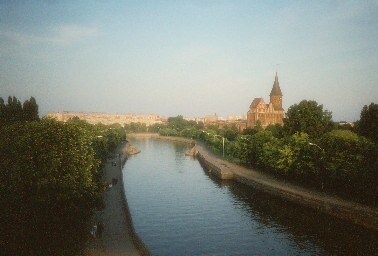 In 2000 it was declared the European Capital of Culture and in 2006 a UNESCO “City of Music”. 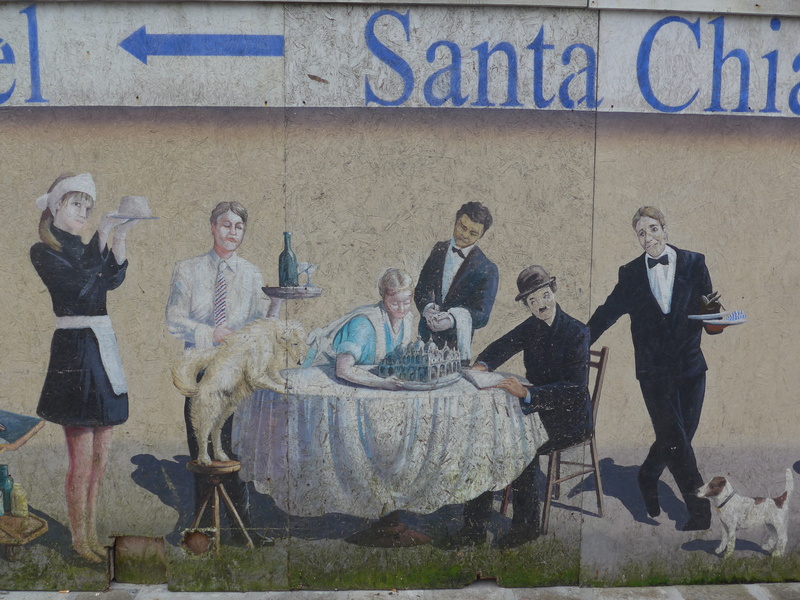 My local neighbourhood at home is full of street art but on this occasion, really glad to see there’s very little of it here as it’s one of the most architecturally important cities and I’d hate to see it ‘painted’ over. 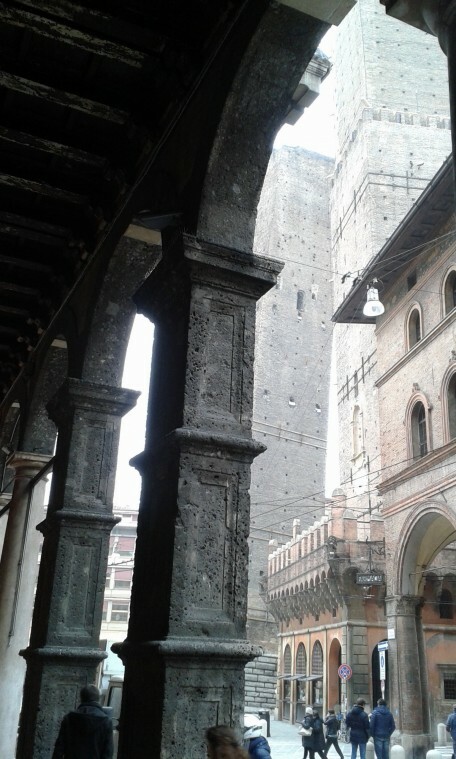 Historic towers, antique buildings, churches and the layout of its historical centre along with works of art, thankfully, are the result of a first-class architectural and artistic history. You may even feel you’re on a movie set with Roman soldiers about to storm through as the medieval atmosphere has been carried over here for centuries. 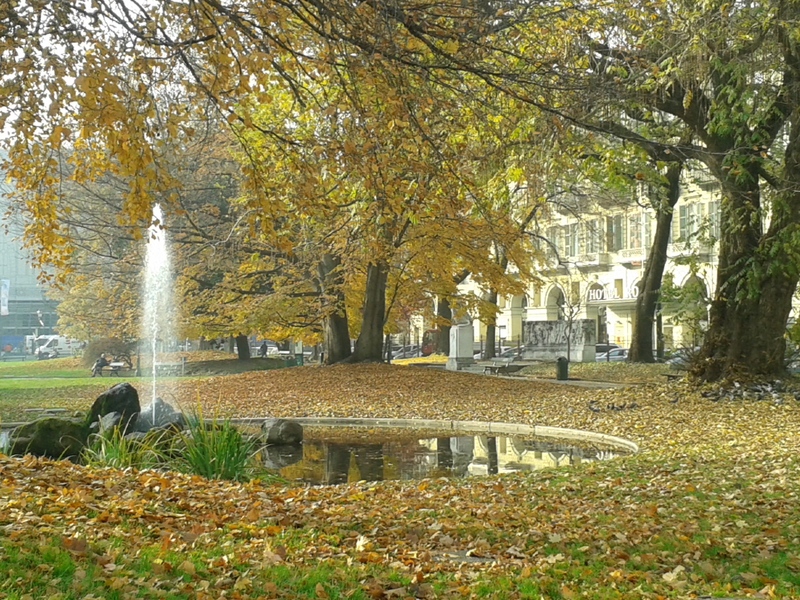 Margherita Park and the surrounding neighbourhood is a lovely area of town to seek solace and spend a peaceful Sunday. Not too far are there’s a market with beautiful fresh flowers and produce. Have a seat? Don’t mind if I do amongst the pigeons who are pecking away madly at some crumbs. Point taken and no explanation needed! 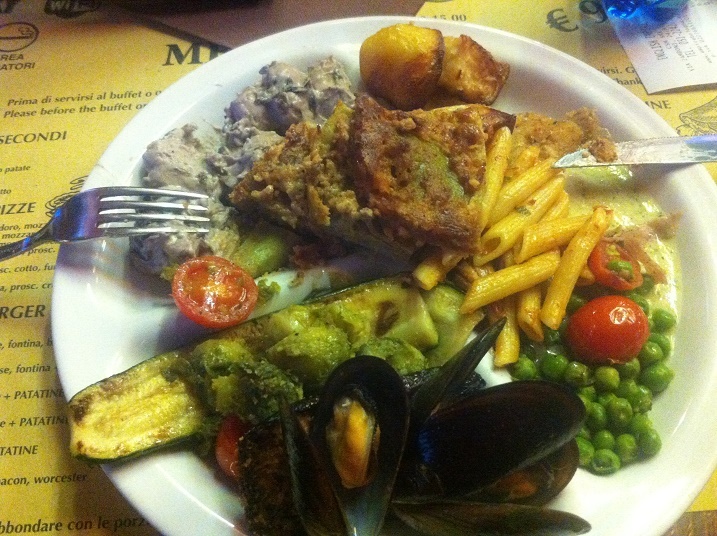 If you come to Bologna for one reason, let it be the food. 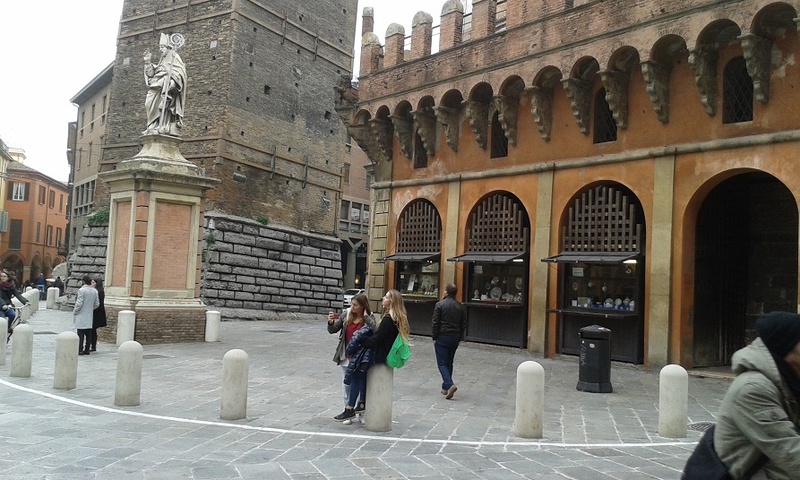 It is informally the culinary capital of Italy and it isn’t nicknamed “Bologna la grassa” which means “Bologna the fat” for nothing. 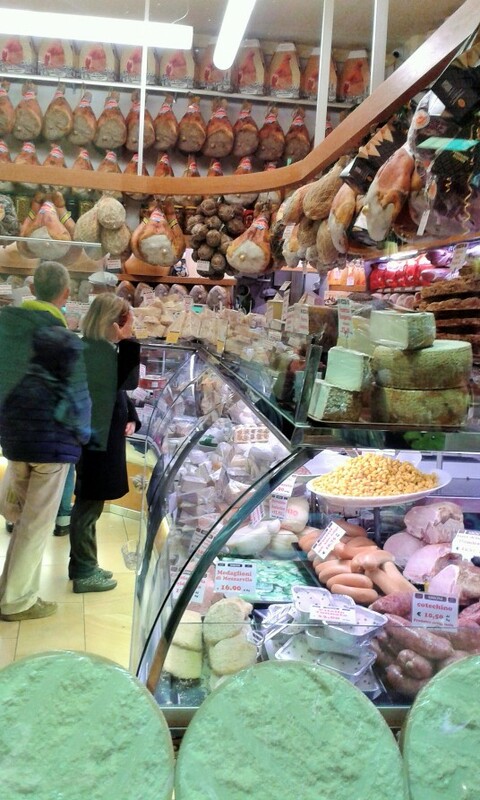 The market in the city centre is one of the largest in Europe and has a huge array of fresh cheeses, meats, fruits, vegetables, dairy and baked goods. The best deals are the balsamic vinegar from nearby Modena and prosciutto from Parma. Yeah, it’s that time of day to say bye and a bit sad. 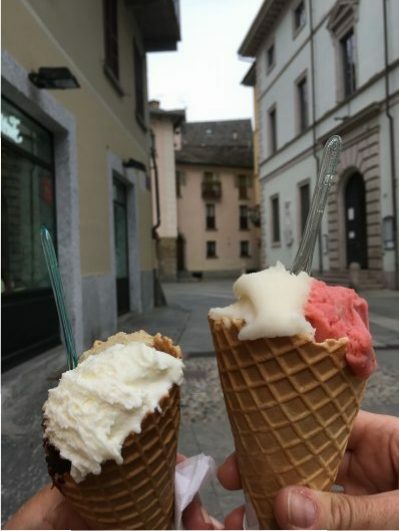 One day or two days are just not enough, next time around I’ll base myself in Bologna and then do day trips from there as it’s quite central to so many other places in northern Italy. Haven’t ever traversed along the east coast of Italy and now heading south towards Bari to see what’s in store there … As for Bologna – I’ll be back without doubt. 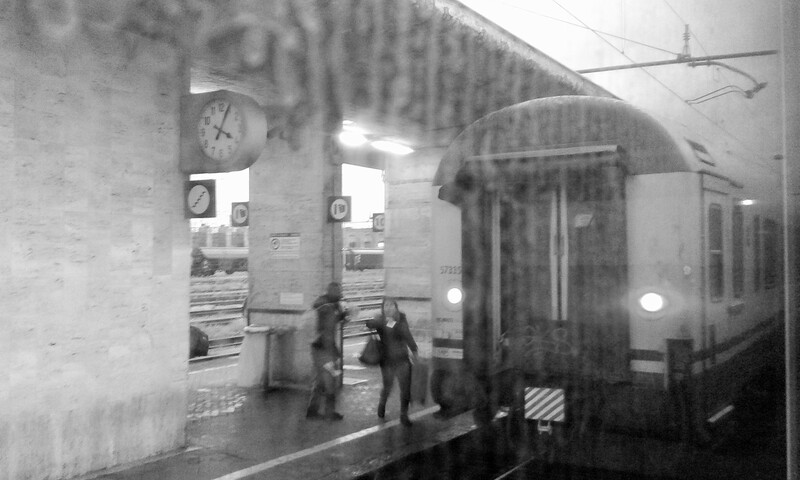 Venice to Munich by City Night Line (CNL). City Night Line (CNL) trains are operated by Deutsche Bahn. A wise option by saving the daylight hours and allowing you to rest up, especially if you’ve travelled throughout this region previously. 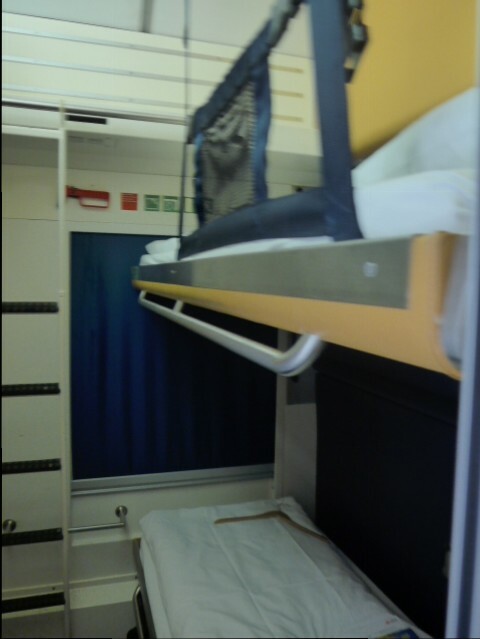 A three-bed compartment at 55.00 Euro per person is ideal for families. 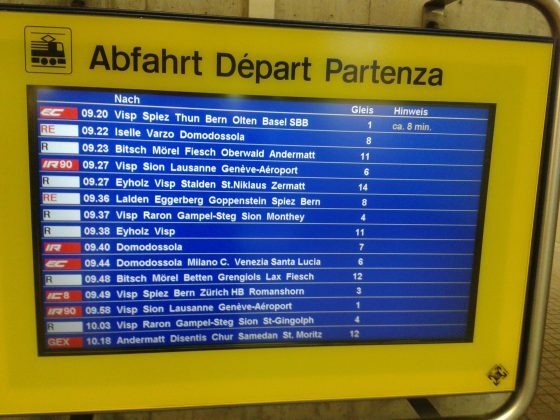 However, you still need to use one day on your Eurail Pass. But the great benefit of departing after 7:00 pm at night you will be able to record the time and use the following day for further travel. Note: Prices are based on low season and adjustments are made for high season levels. 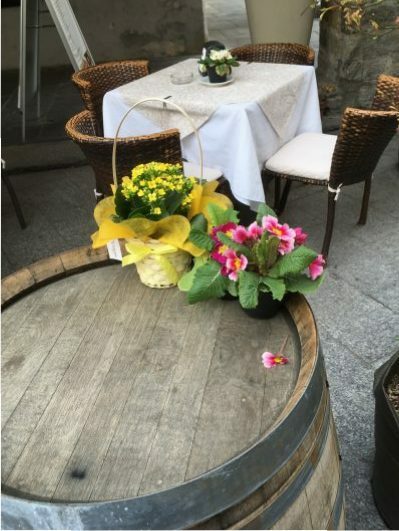 An early reservation is highly recommended. 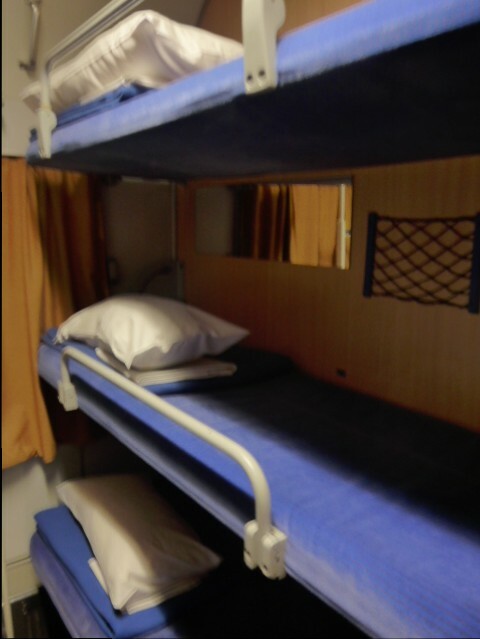 A couchette with beds for six passengers can be as little as 27.50 Euro per person. 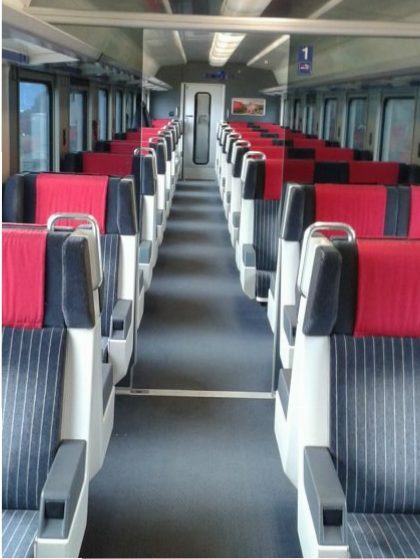 And private facilities for a double will be approximately 75.00 Euro per person. A first-class Pass may only be used to book these cabins. 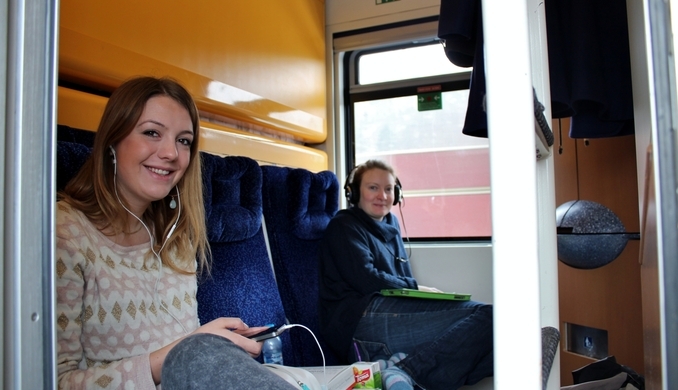 Compulsory reservations are required for all CNL trains. A big thank you to my Conductor Edward who, once had his passengers settled and tickets checked was kind enough to allow me a site inspection of this particular night train. Note to Deutsche Bahn: Keep an eye on this young man as he is a polished professional with a passion for his work. 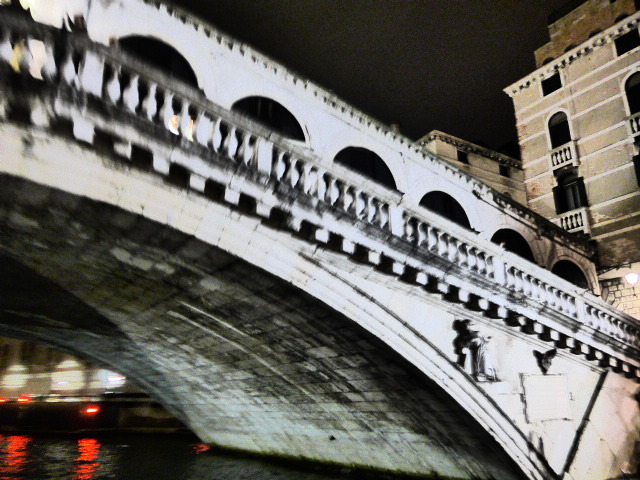 I’d made an earlier assertion Avignon’s Saint Bénézet bridge was perhaps the most photographed bridge, however I’d forgotten about the Rialto Bridge in Venice. 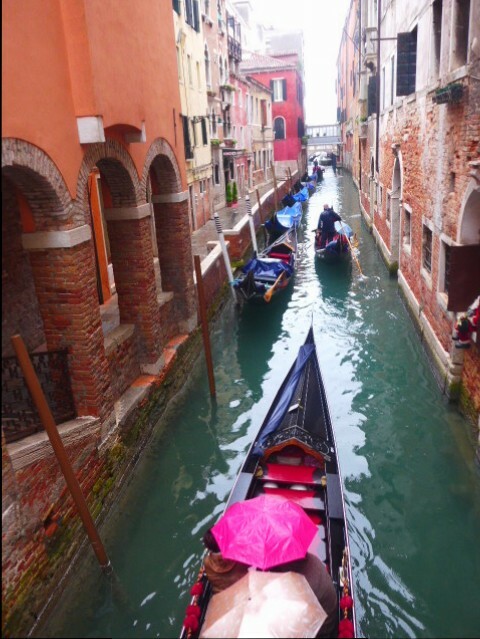 But then again, you might consider a Gondola ride – very romantic but can be quite costly and here’s a guide for you. 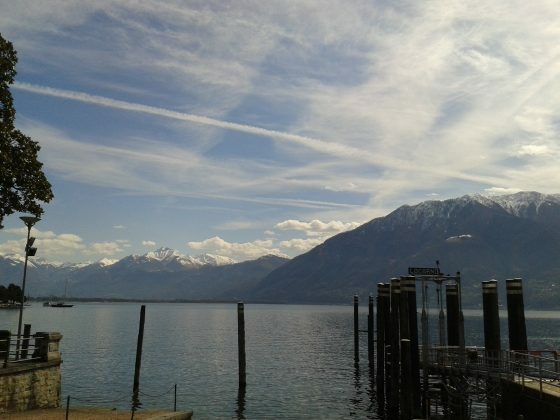 •Gondola fares are standard and set officially and the minimum fares for a standard gondola ride is approximately 80 Euro but rates can go higher. 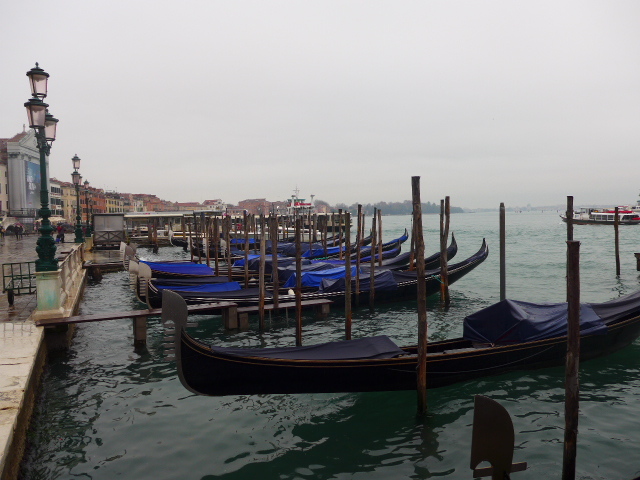 •A standard gondola ride is 40 minutes so if you negotiate for a lower fare, you’ll end up with a shorter ride. 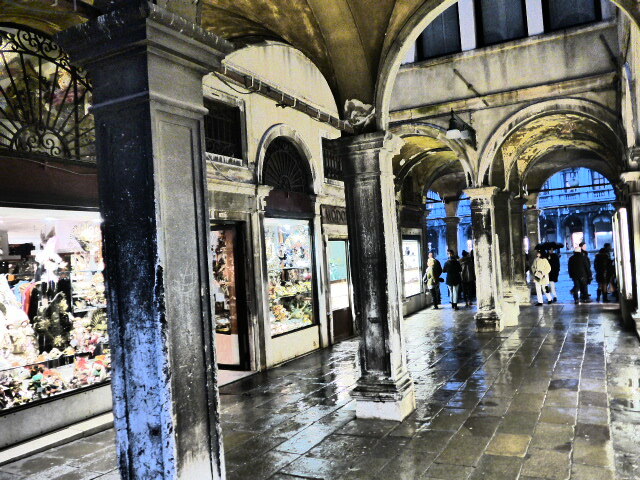 •Gondola fares are higher at night. •Gondolas hold six people and can be shared without affecting the fee so you can save money by sharing a tariff with several people. 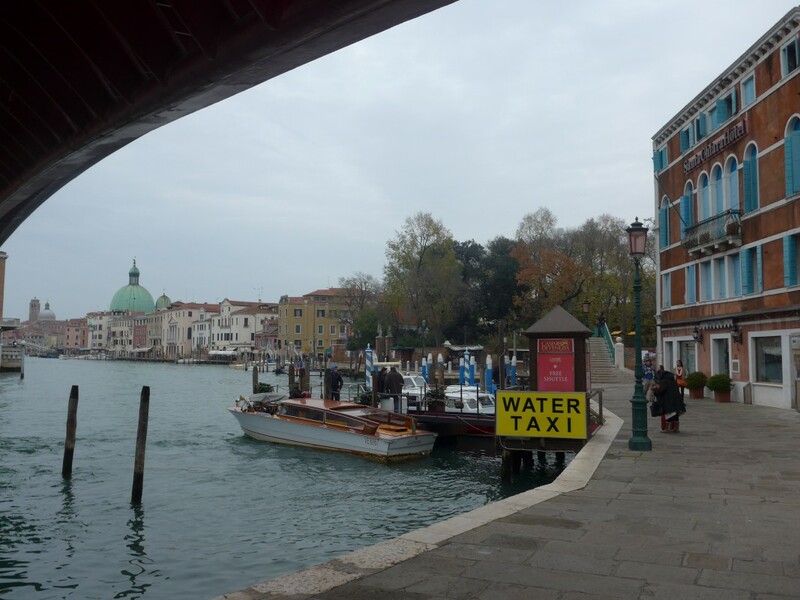 • If you book a gondola ride through a hotel or agency, there’s likely to be an additional fee built in to the price. Water Taxi, be it private or shared public is the cheapest and fastest way to make your way around. 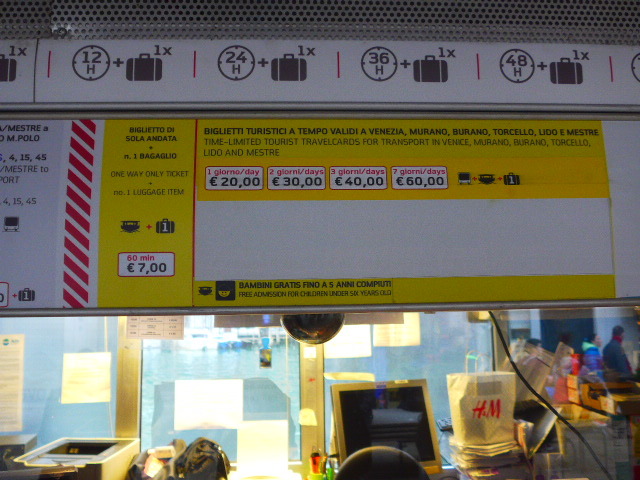 20 Euro will allow you to have 24 hours access of water taxis, local buses and the train which shuttles between Maestro and St Lucia Stations – about every 10 minutes. The ticket is activated upon the first time you use it. 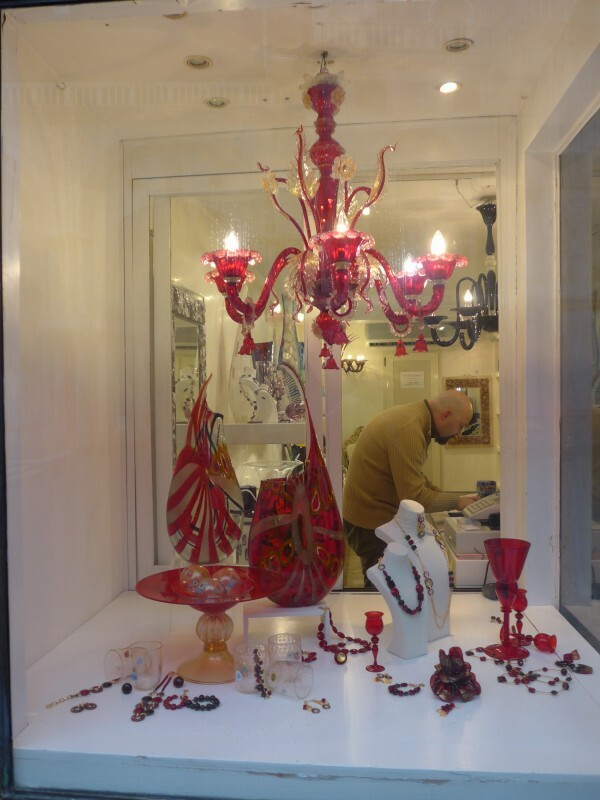 Although the island of Venice itself is not famous for glass blowing, the island of Murano, just north of the city is world renowned for glass making. 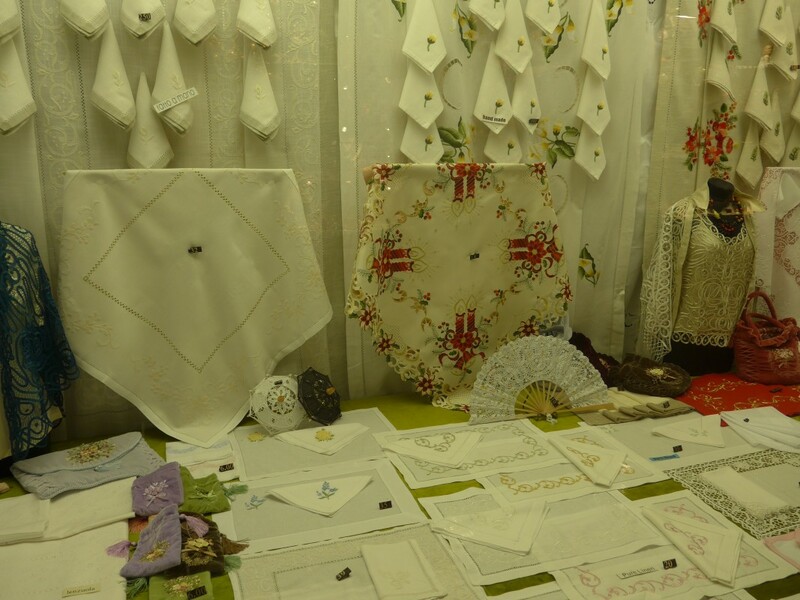 Nearby Burano’s main claim to fame is its centuries-old lacemaking tradition. 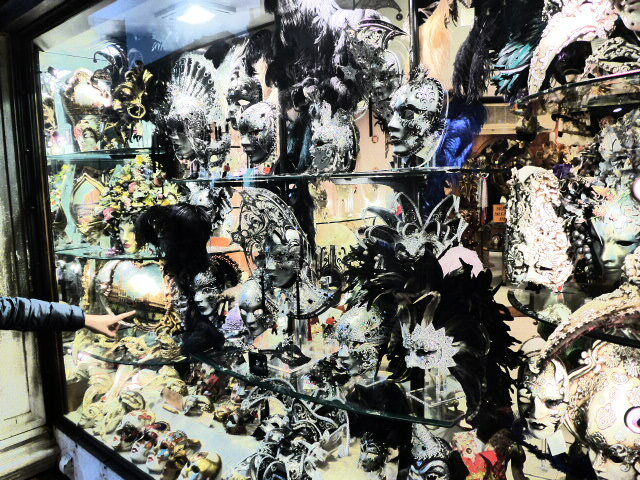 The Carnival of Venice is an annual festival and ends with the Christian celebration of Lent and is famed for its elaborate masks. 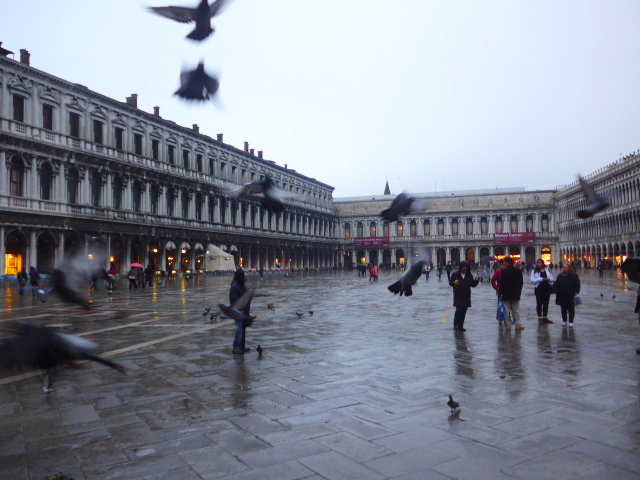 Walking around Piazza San Marco whereby there’s no shortage of cafes and restaurants. 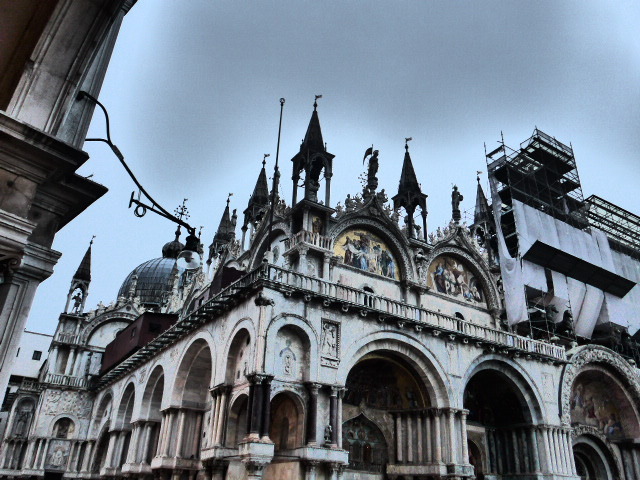 St Mark’s Basilica, the whole of the west façade with its great arches and marble decoration cannot be missed. At 5:30 pm Sunday evening there was a free concert given with the Cathedral’s organ being played with some of Bach’s compositions to a captivated audience. Cutesy café for a cuppa. 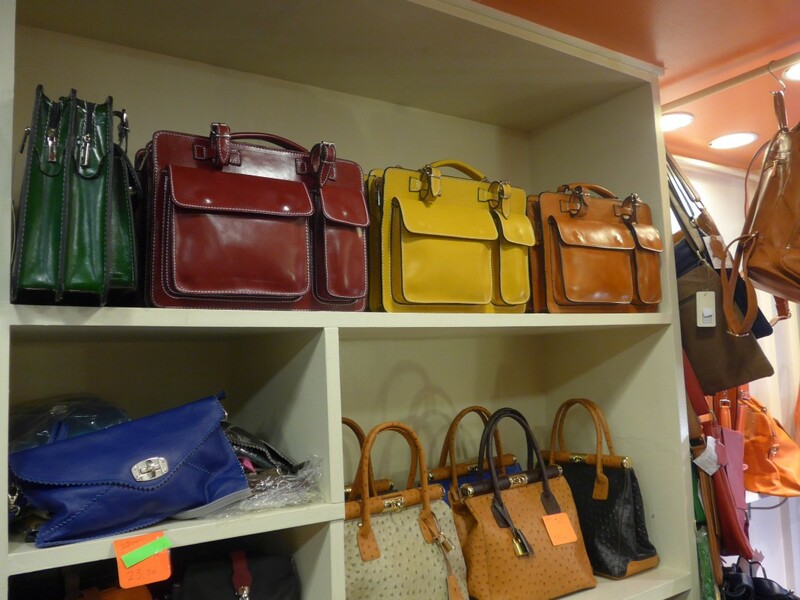 Leather handbags at 43 Euro each, think I’ll have one of each colour at that price! 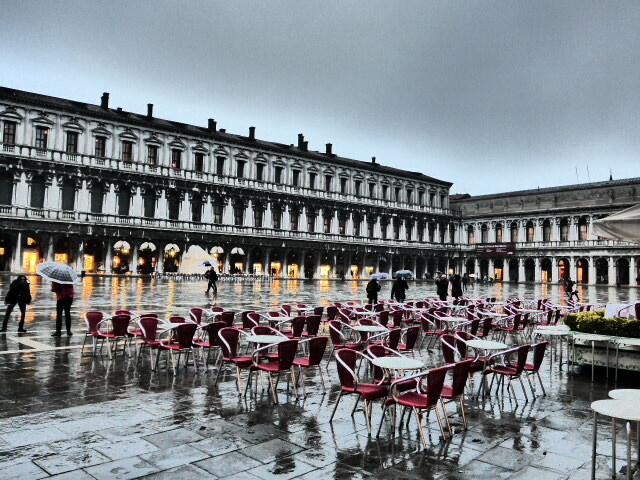 It’s said Venice is sinking. I checked www.livescience.com and it seems the case. Time to have something to eat and drink myself. Umm so many choices and really cheap by Sydney prices, but then again it’s low season.